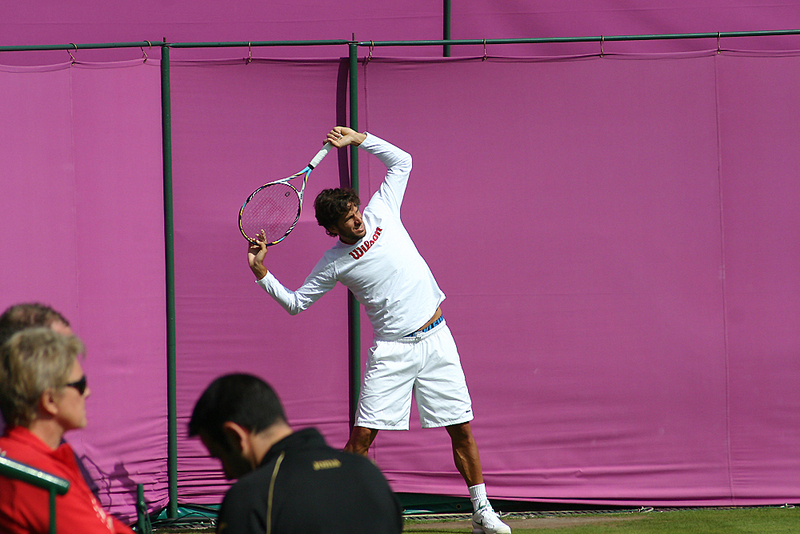 To go with yesterday’s photos of their practice session, here are some photos from the doubles! 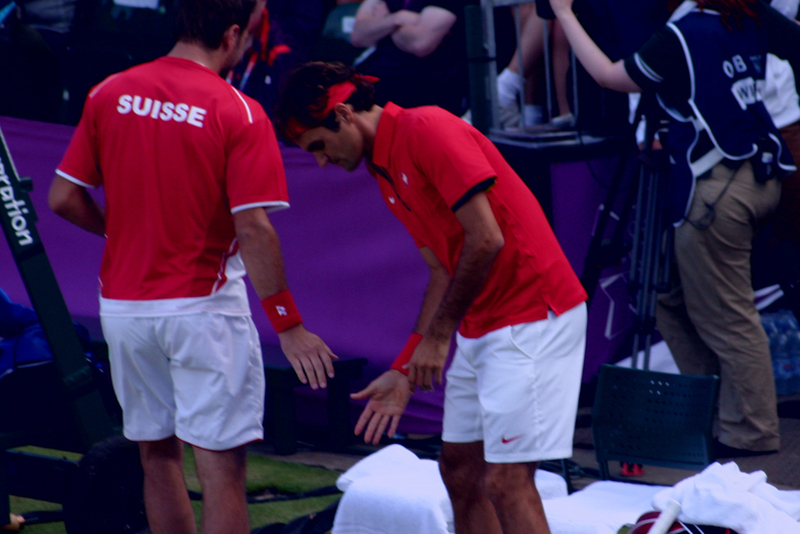 I’d never seen them play together before, it was great fun to watch all their hand signals and things like that. They played so well in the first, but Ram and Erlich ended up too good in the end of course. Click the photos to embiggen! If sharing elsewhere, link back to here as the source and include credit. Thanks! 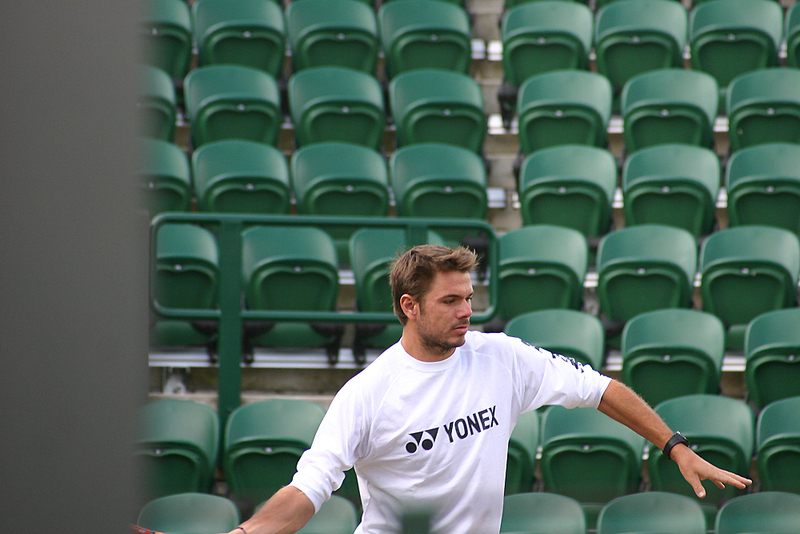 Today was my last day visiting Wimbledon for the year, so I made the most of it by catching Fed and Stan’s practice session as well as their doubles match later on. 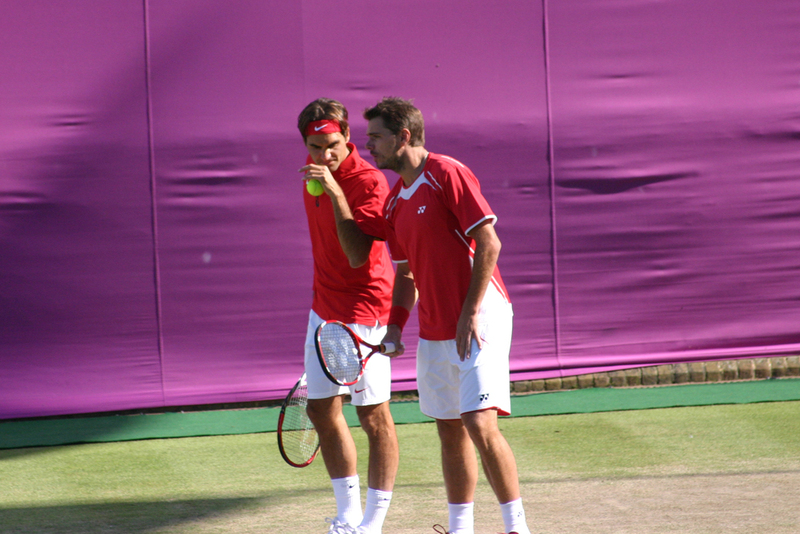 Roger and Stan hit with each other for about half an hour from 10am this morning on Court 4; here are the photos! 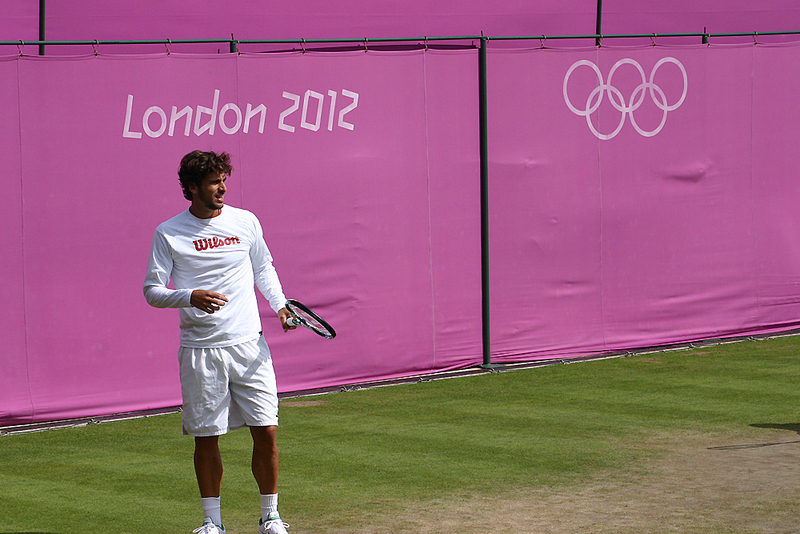 Photos from the doubles match later in the day will be posted soon. Click on any photo to embiggen! Please don’t repost without linking back to here and giving credit! 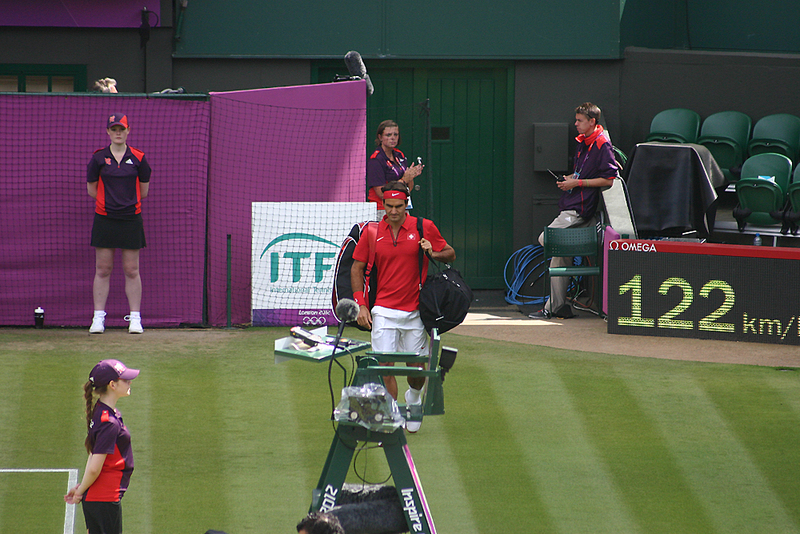 When Federer went down two sets to love and trudged back to his seat with a blank expression on his face, I admit that I began to think about what I would do after he lost this match. 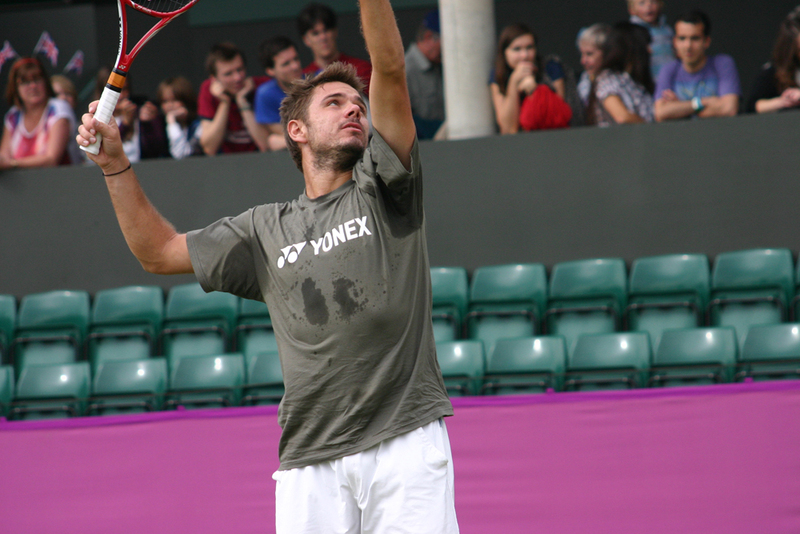 When a guy is reading your serve as well as Benneteau was, and seemed to be beating you from the baseline as frequently as Benneteau managed, it seems like there’s very little you can do. 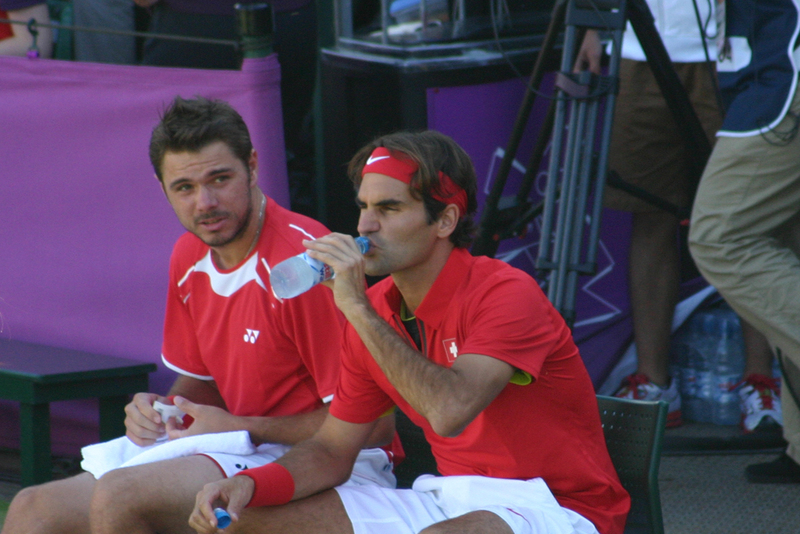 Roger had broken early in the second and seemed to be steadying the ship, but as we all know, Julien broke back, and losing a marathon twelfth game to force a tiebreak meant that, according to Roger, he “just kind of felt that the breaker was going to be a rough one” for him. It was. He lost it 7-3, and I put my head in my hands. 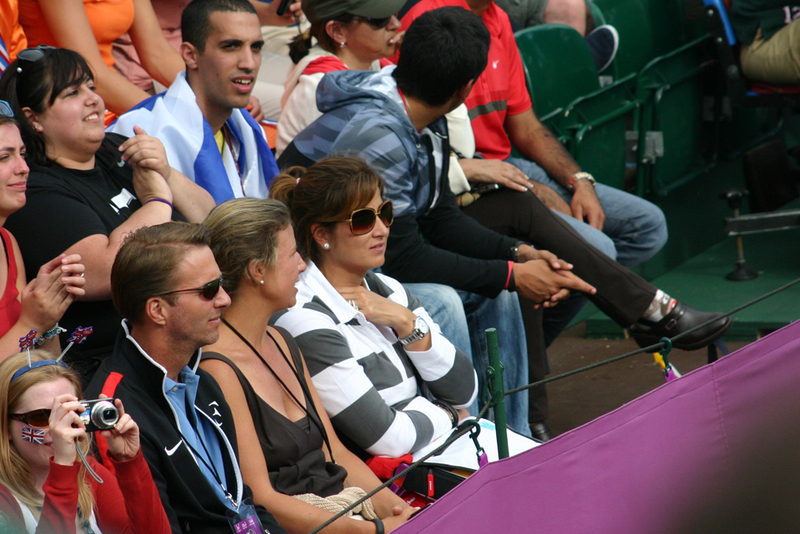 The French fans in the row in front of me who had been good-naturedly cheering for their countryman up until the breaker were talking uncertainly, no longer so happy with the result. 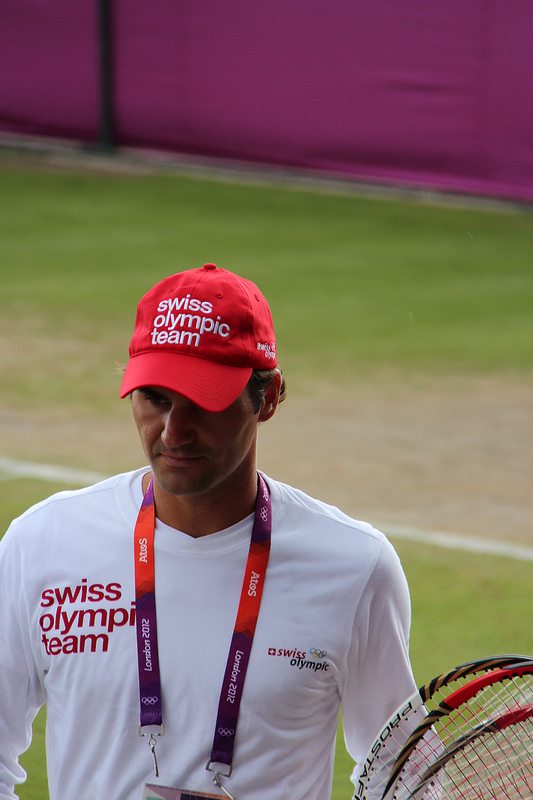 So, the mood was grim, but the match was not yet over. 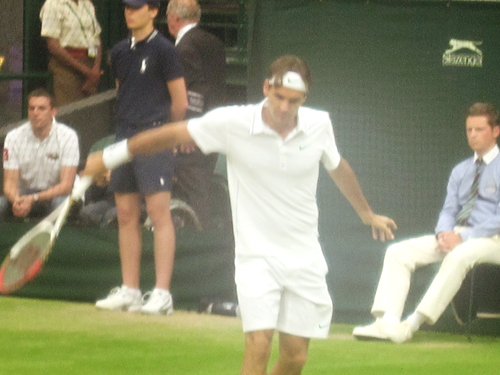 I thought back over the preceding two sets, and managed to pick out one particular moment that made me smile – Roger, struggling to break for the set, had shouted “ALLEZ!” as he earned an opportunity. 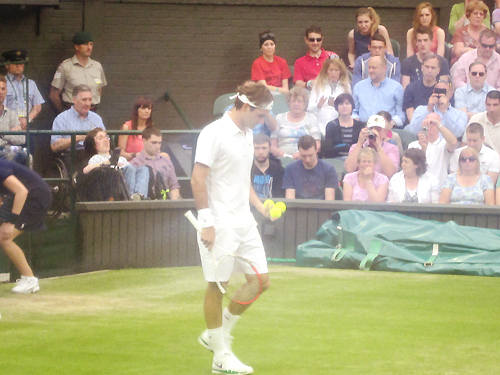 I’ve seen him play five matches live before, and all of them were relatively easy. 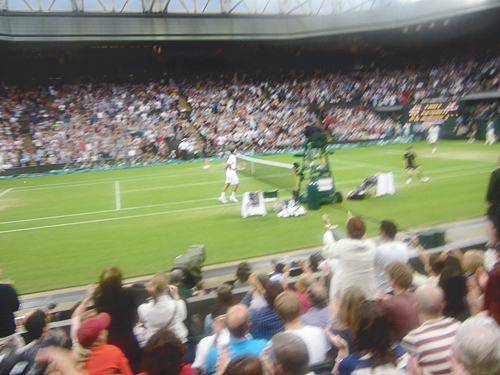 The most nerve-wracking moment I’d experienced was probably one 7-5 second set he won against David Ferrer at the World Tour Finals a couple of years ago, and the nerves of that moment were partly mixed in with my own personal need to see him win in time for me to catch the last train home. I’d never seen a dogfight from anywhere except for my sofa in front of the television. 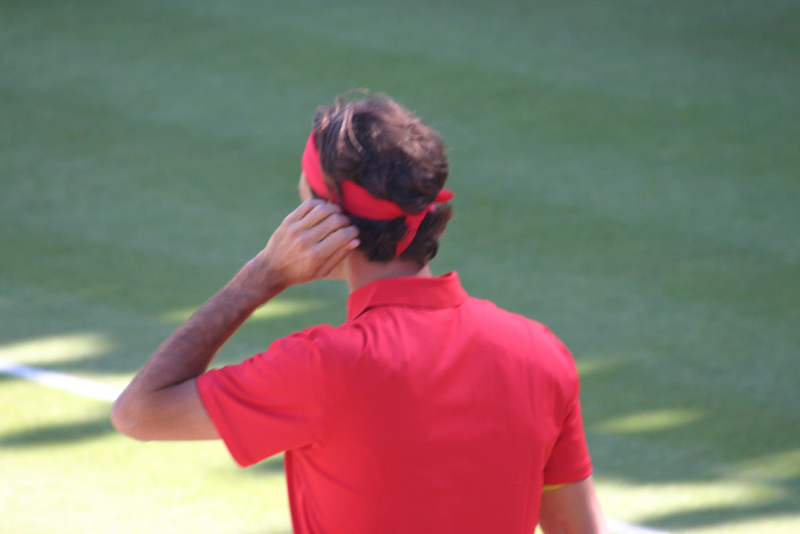 Hearing him yell to himself in encouragement from just a few metres away was, I have to admit, amazing. 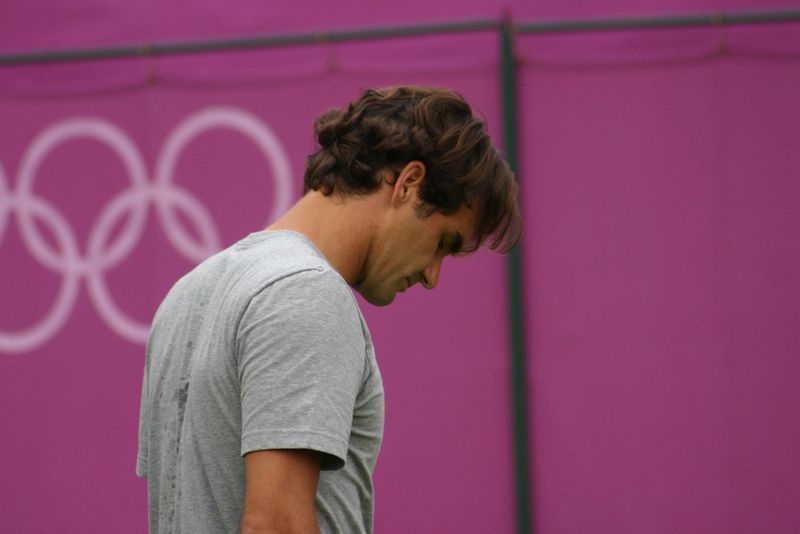 Even if he was going to lose in three straight sets, I told myself, he was still here, still fighting, still willing himself forwards, still the irrepressible champion I fell in love with all those years ago. 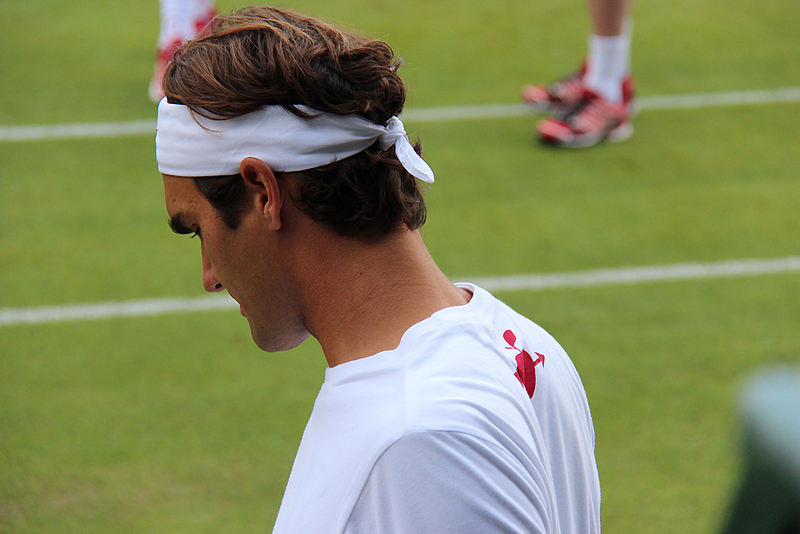 What’s it like getting to see Roger on Centre Court? 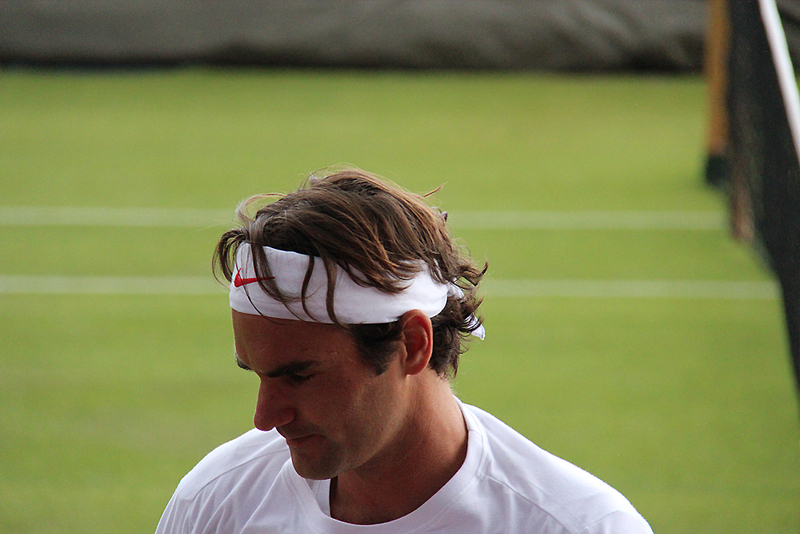 I had travelled to London and camped out since Thursday morning for a chance to see him play. 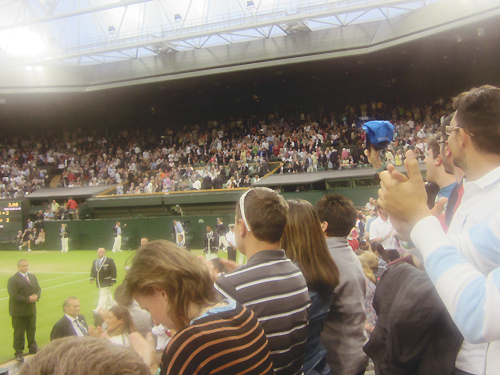 I had followed the preceding day’s upsets on a whining dynamo radio in the tent; the roars of Centre Court could be heard all the way from the campsite about a kilometre down the road from the grounds, and all evening people in nearby tents could be heard groaning and cheering as one of the most shocking days in Wimbledon history came to a close. 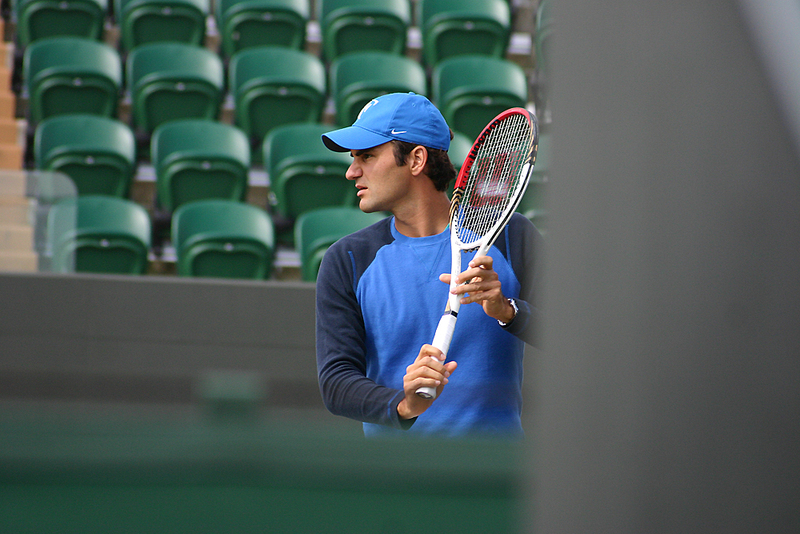 I was so excited about seeing Roger the next day, but never would I expect that his match would come anywhere close to the spectacle of the preceding day’s play. We were woken at 5am by the stewards, packed up our kit, and at around 7am started shuffling lazily down Church Road until, after a bit of waiting around and reading the paper, we were finally admitted at around 9:30am. 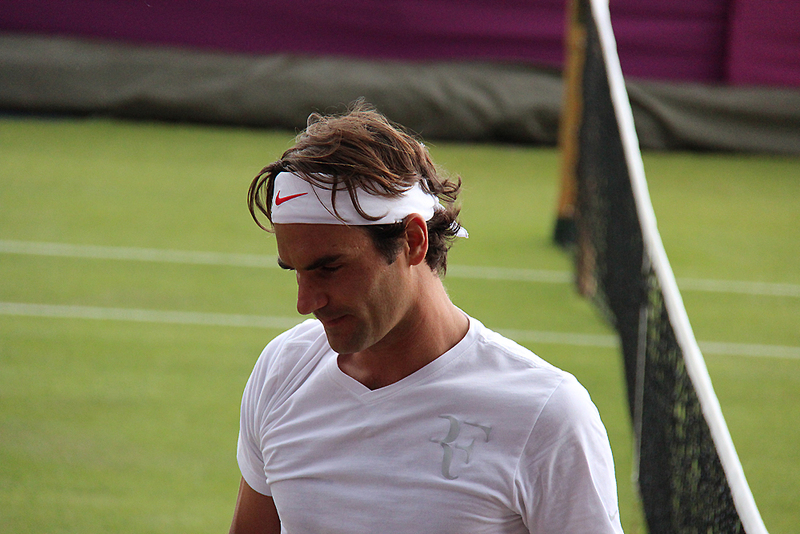 Wimbledon is amazing. This was my fifth visit, but the beauty of camping means you get the best seats in the house as a reward for your dedication. My sister and I were 6 rows behind the players. 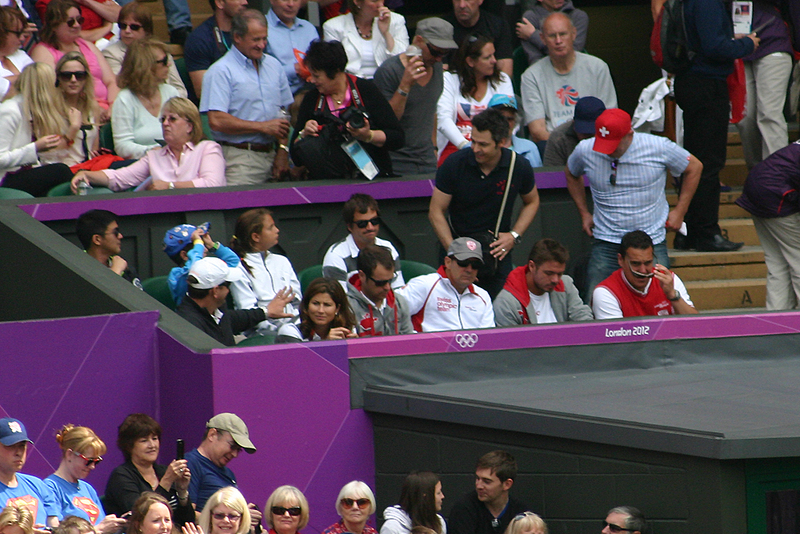 At other tournaments these are the sorts of seats reserved for corporate visitors who spend half the match time sipping champagne while the real fans crane their necks to see the distant figures of the players a long way below, but not at Wimbledon. 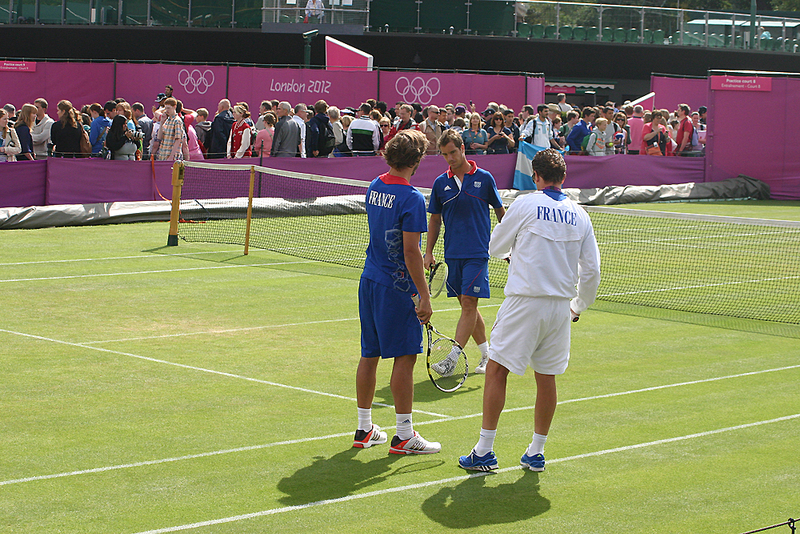 I spent a bit of time, before play began on Centre, near Aorangi Park, where the players practice. 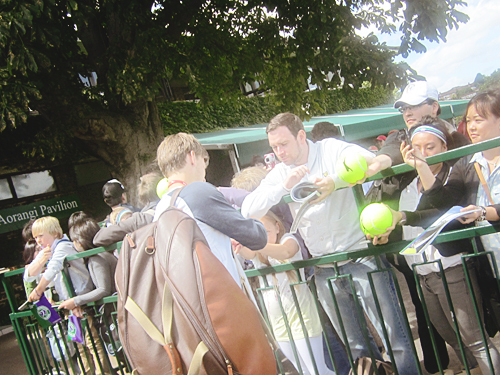 I’d never got autographs anywhere before, having never had the chance, so props again to Wimbledon for being fan-friendly! 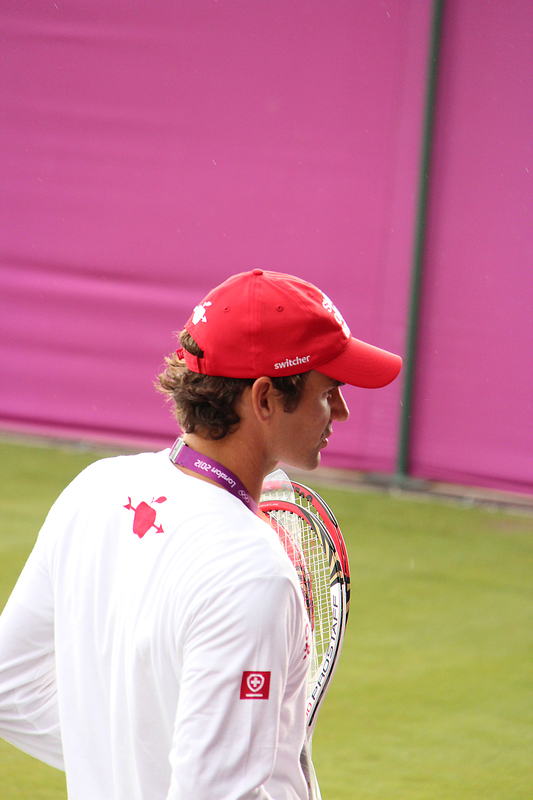 I was lucky enough to see the Williams sisters, Murray, Tsonga, Kvitova, Roddick, the Bryans, Ferrer and others hurrying past to practice. 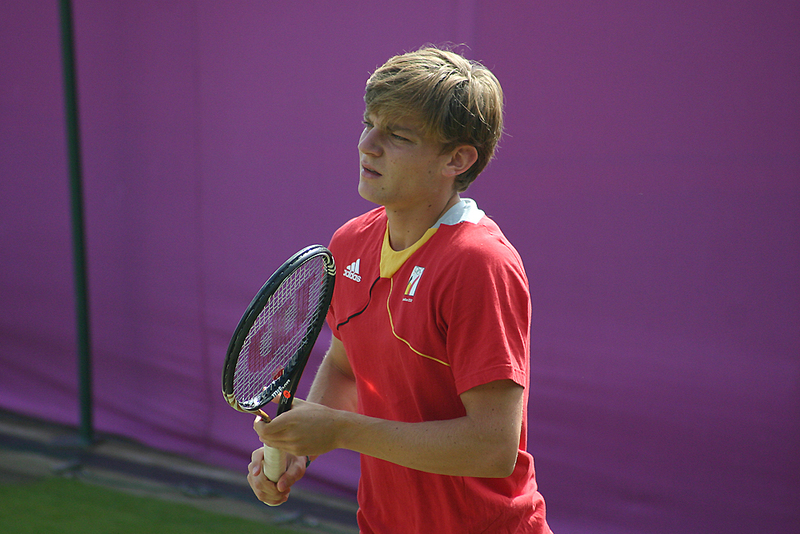 A particular highlight was when David Goffin came by, and despite seeming a little shy and unused to the attention, kindly signed for anyone who asked him to. 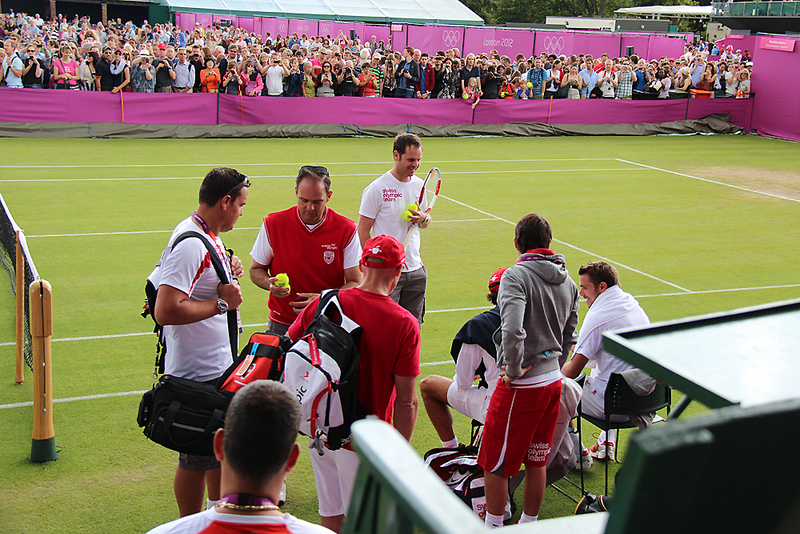 At one point multiple camera crews descended, shouting excitedly, and round the corner came none other than Lukas Rosol, commanding more attention than all the top players combined; he too kindly took the time to sign for a few fans. Anyway, before long 1pm rolled around and I was able to watch two very enjoyable matches, Djokovic-Stepanek and Watson-Radwanska. With those over and Centre almost full, at 5:35pm there was a roar from the southerly members of the crowd as first Julien, then Roger, walked onto the green grass as we provided them with a respectful standing ovation. I apologise for the inadequacy of my camera as I attempt to relay what it was like, but it was really, truly incredible being there and seeing it all. 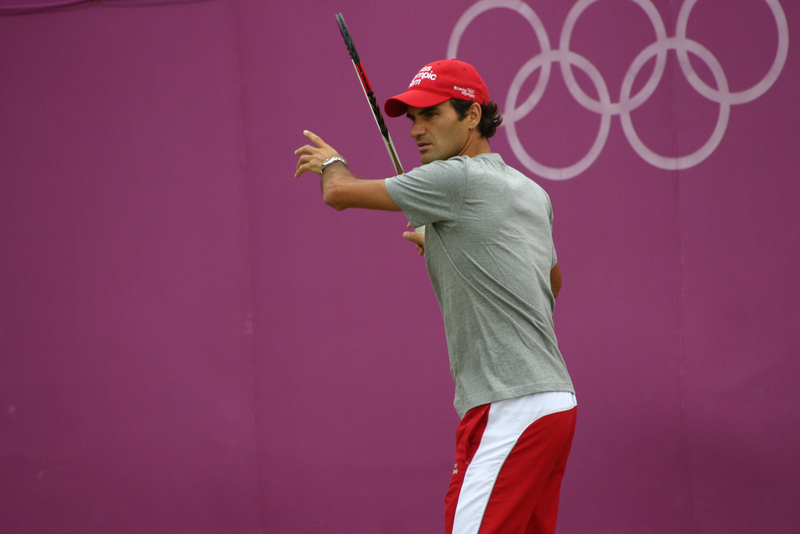 A shot that would look like a shallow, limp forehand on television would seem to whiz past with incredible power and accuracy when you’re just a few metres away. 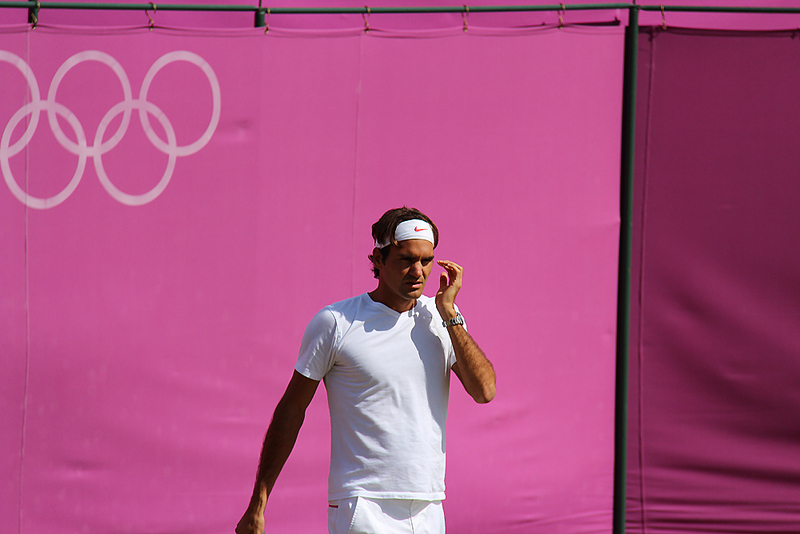 After the match, when I returned home many, many, hours later and read a few post-match reports in a semi-dazed state, I was faintly bemused to see Roger’s start being described as slow and lazy. 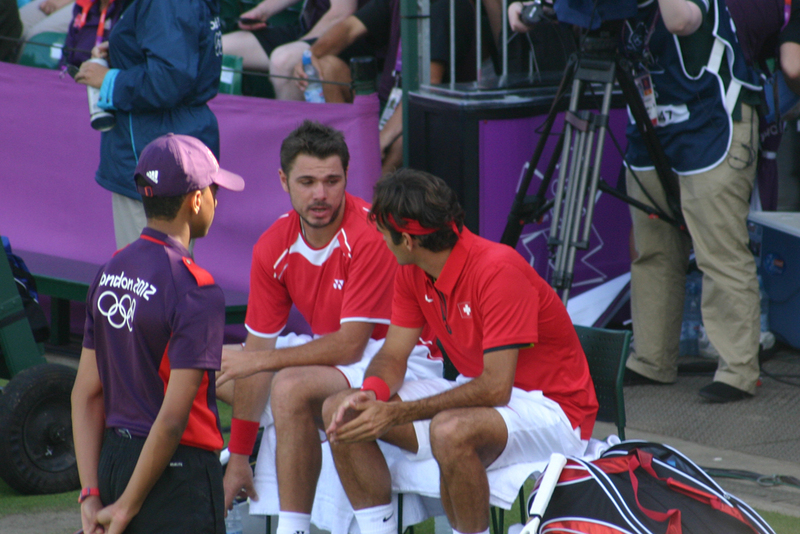 Sure, there were unforced errors, but nothing too bad. When you’re there, in close proximity to every shot Julien hit with depth and power and accuracy, there was nothing to be done except applaud his brilliance. 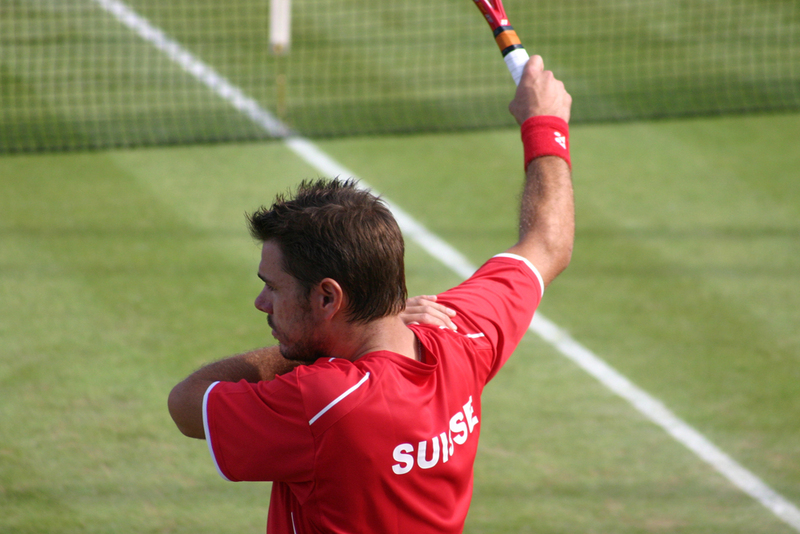 You can see players at tennis clubs and people playing for fun, but they’re light years below the pros. 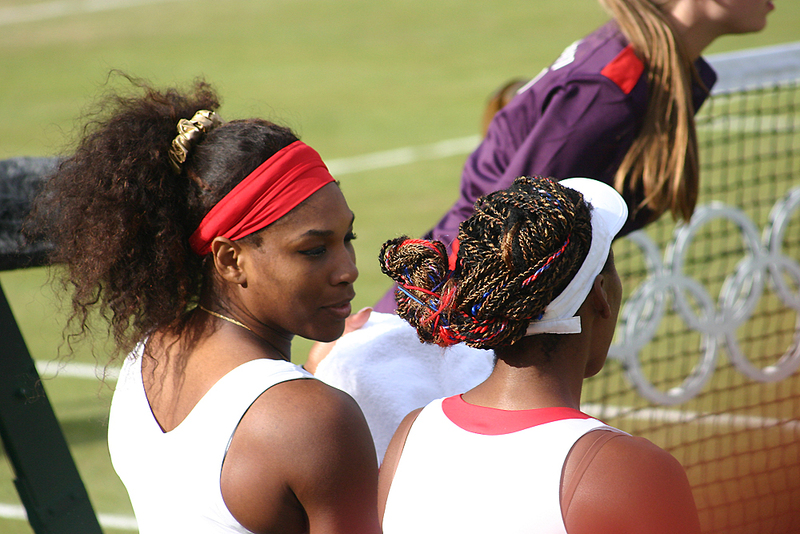 For these two, the speed of their forehands and backhands was incredible, the volleys were unbelievable, the footwork was beautiful. That was just the warmup. It was when things got to *4-4 that things got tight. 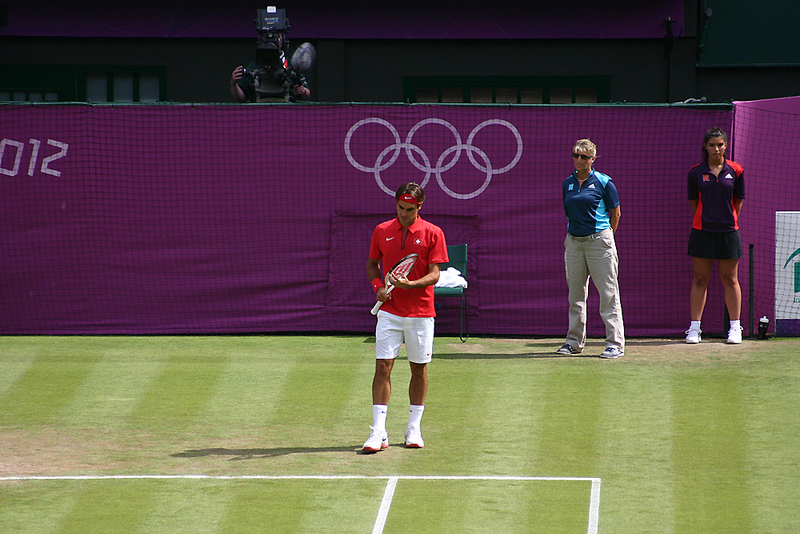 Federer hadn’t broken in the previous game, despite being two points from it. 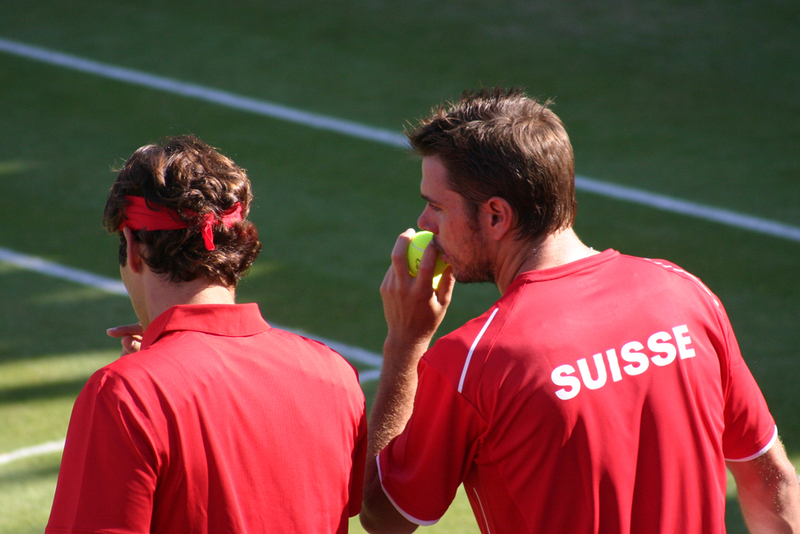 One French fan in front of me had been squeaking “Allezzzz!” in a high pitched voice (for Benneteau) far more often than most would have expected. 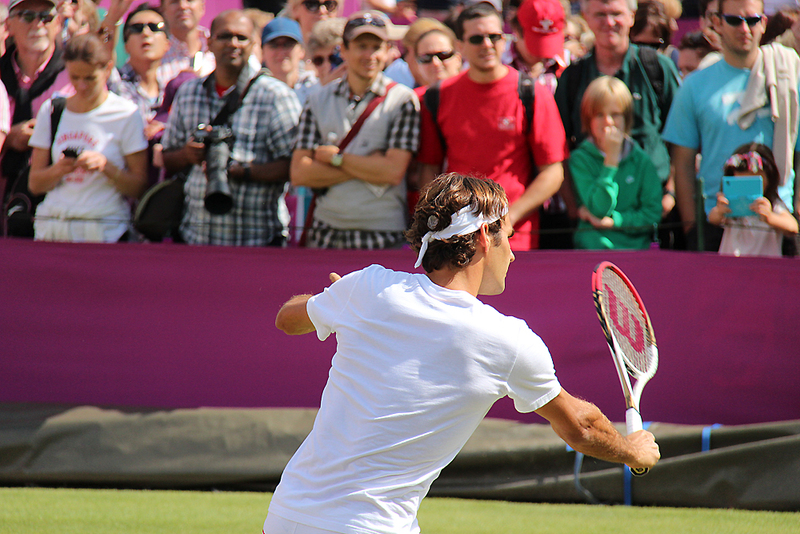 Four games was the most anyone had taken from Federer in a set so far. 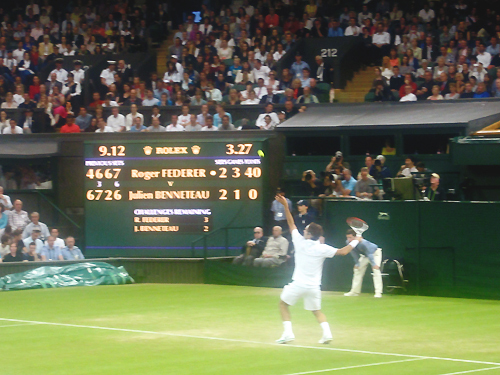 Yet Benneteau earned the break, with an impossible backhand up the line, a fantastic return… and then a Federer backhand thwacked into the net. The crowd let out a groan of disappointment at the error, but the set was not yet over. 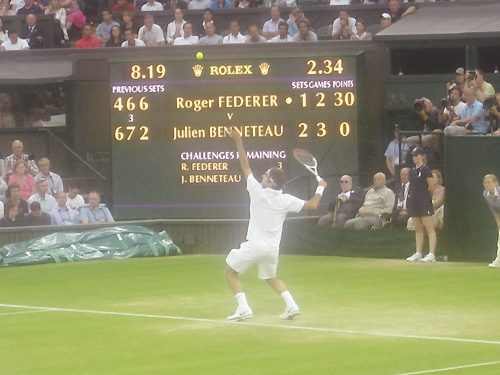 The players zipped back and forth across the baseline in a stunning rally as Benneteau served at 15-0, before his brilliantly angled crosscourt forehand caught the line and Roger could not find an answer. 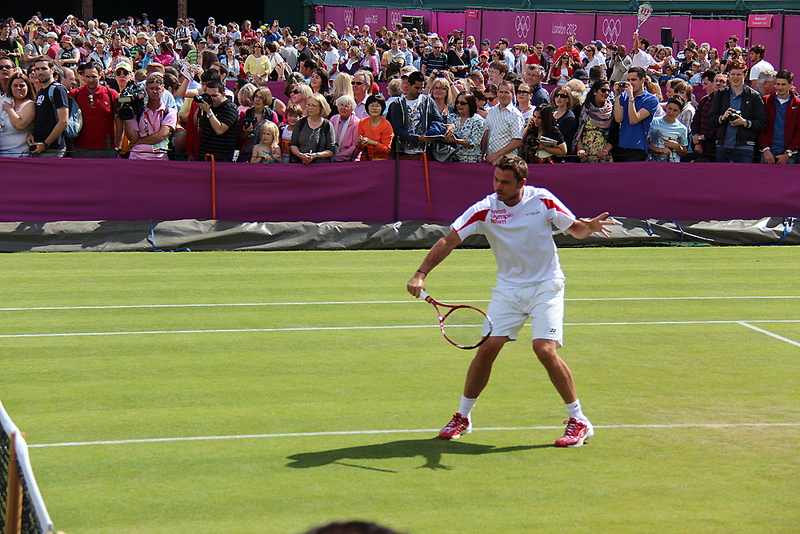 A Federer return sailed wide and Benneteau held. 6-4. He hadn’t flinched. 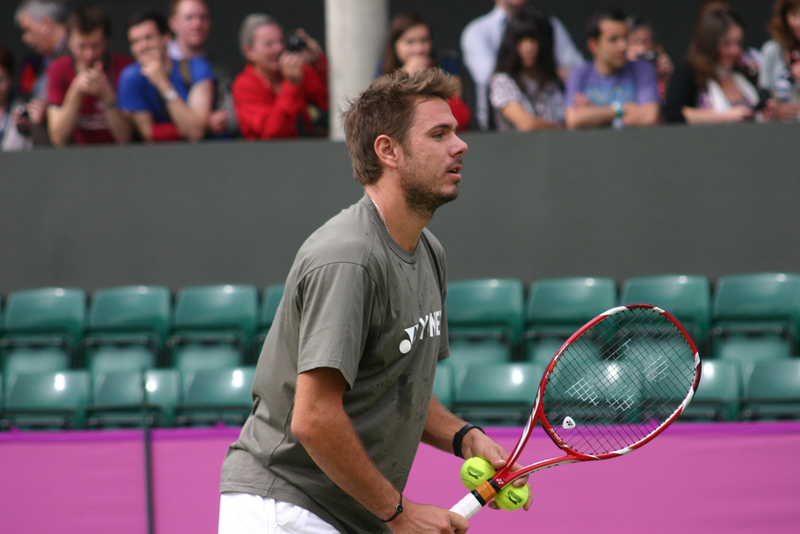 Neither had Rosol. The members of the crowd who had wanted a longer match now had what they had desired. 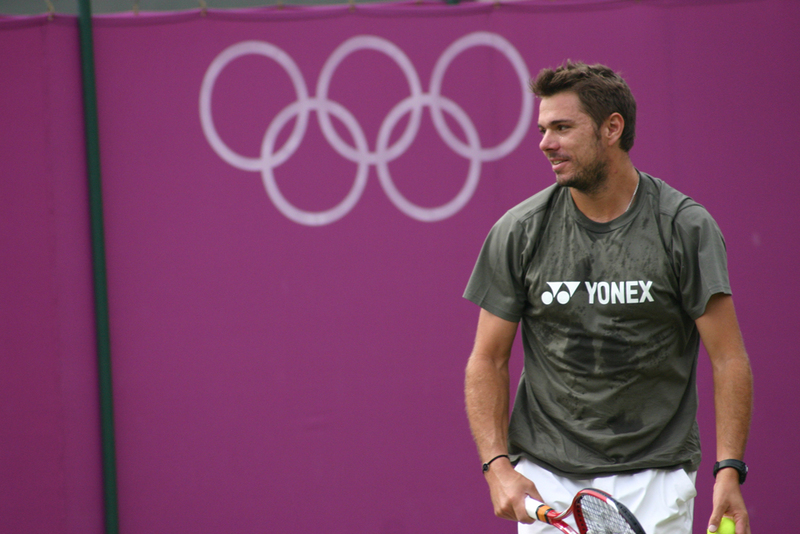 One of the guys who had been hoping for a 6-0, 6-0, 6-0 win had changed his mind. “I just hope it goes five,” he said, nodding enthusiastically. 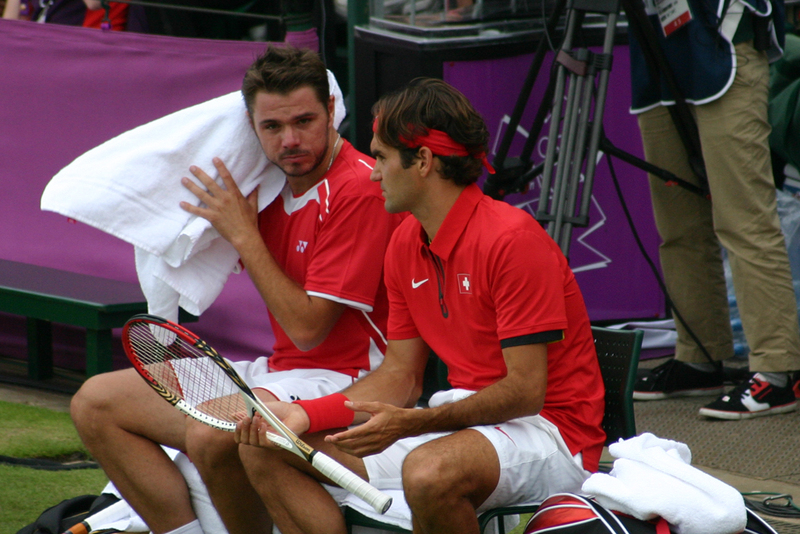 Having, like most Fed fans, suffered through enough 5 set marathons from in front of the television to last me a lifetime, I was fervently hoping for a win in four. It somehow seems that, these days, it’s so much harder to win in four than to end up grappling for dominance over five sets. 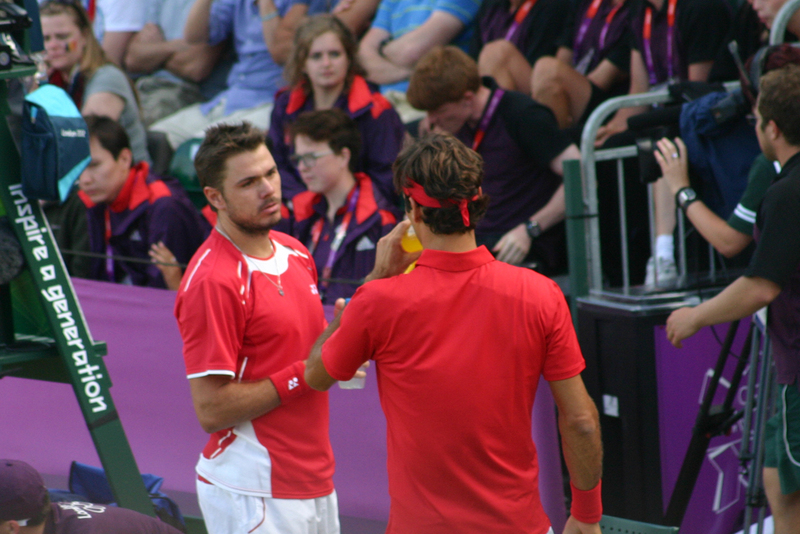 Benneteau believed, and maybe Fed was unsure of himself in ways he hasn’t been in the past; he described experiencing the first two sets in a kind of “fog” to McEnroe afterwards. However, at the start of the second, he did what we had been hoping and expecting he would do; he broke. 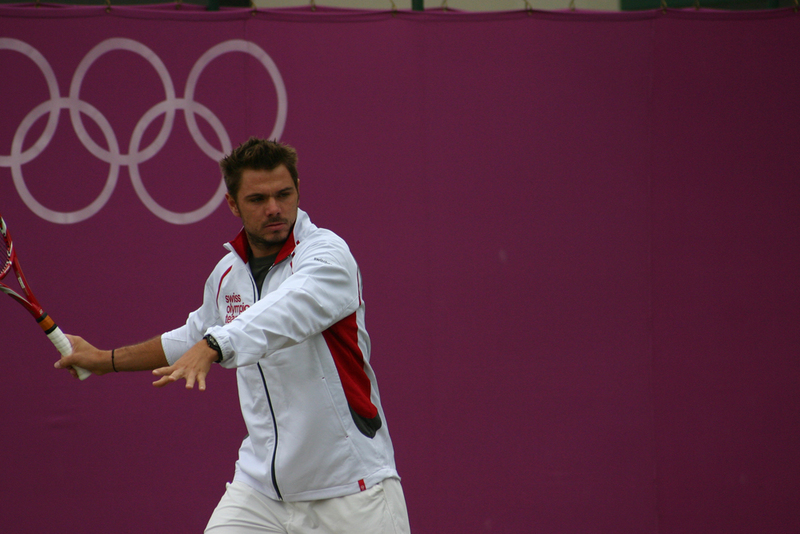 It was at this point that a few people near me let out a sigh of relief, raised their eyebrows at one another as if to say “disaster averted, then?” But it wasn’t to be, and things felt distressingly familiar as he struggled and ultimately couldn’t hold serve. It’s at these moments when you start bargaining; at least he was serving first. 2-1* is better than 1-1*. But the set trundled on. 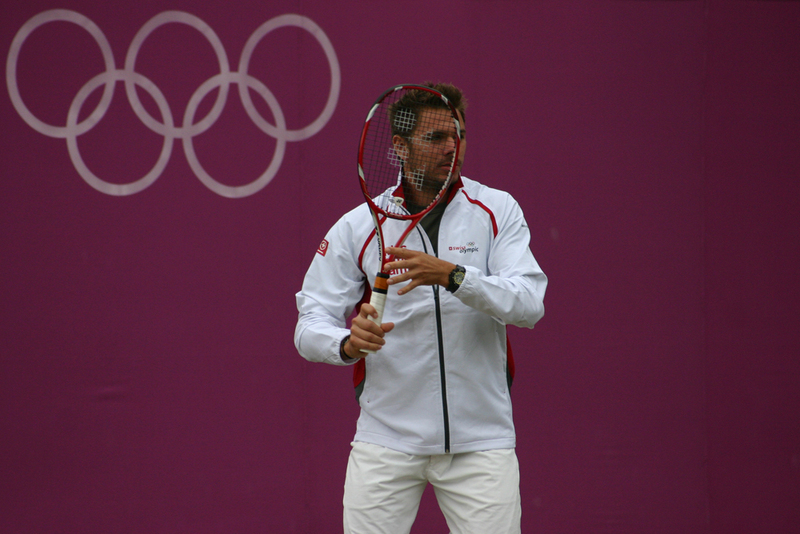 Benneteau’s service game at 4-3* went to deuce, and there was a murmur of anticipation from the crowd; is this where he breaks? It wasn’t. 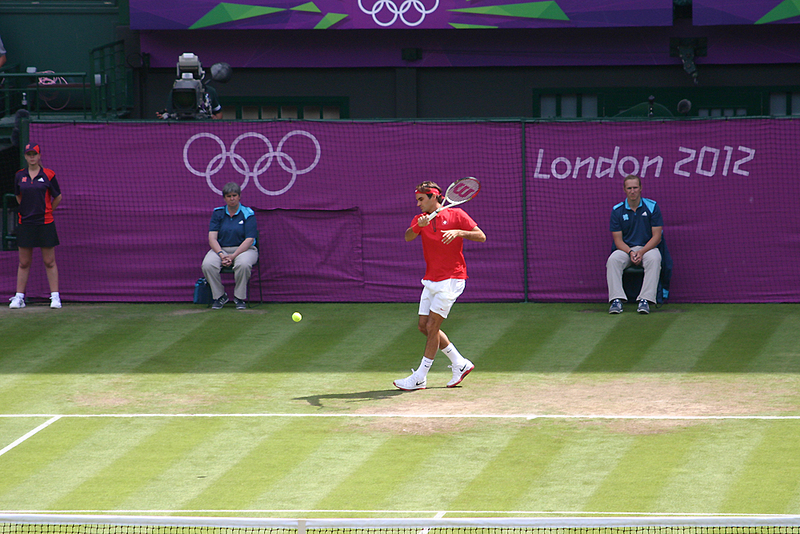 Roger served at *4-4, an incredible return from Julien caught the line, and he was break point down. This was really danger time now. 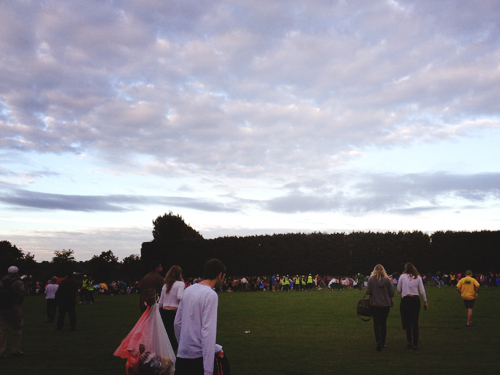 The voices of the crowd rose and some shouted, urging him to save it. 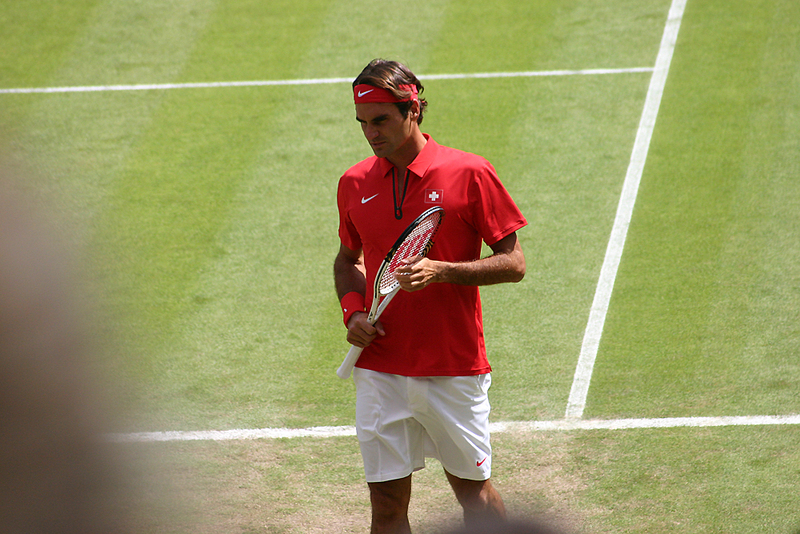 Nearby Federer supporters couldn’t look away; we sat forward, and yelled jubilantly as he managed it, and again when he managed to hold for 5-4. It was never comfortable, though. 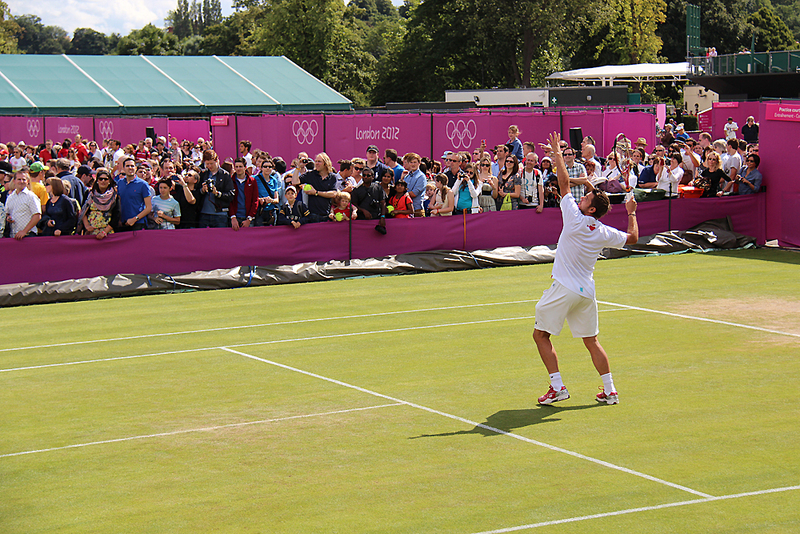 When Roger looked like holding to love for 6-5, Benneteau played an incredible point to make it 40-15. He didn’t break, of course, but mentally it made the difference. He wasn’t going to bow under pressure. 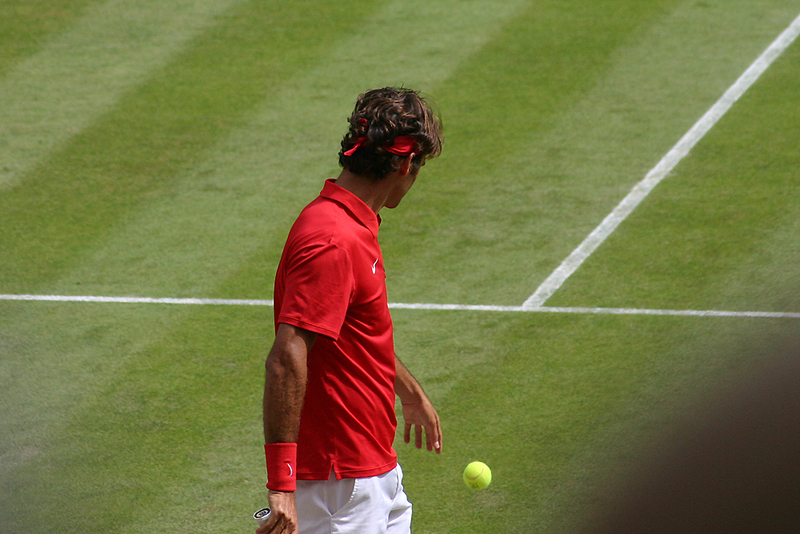 The 6-5* game was torturous and only made better by the knowledge that he could at least take it in a tiebreak if he lost it. 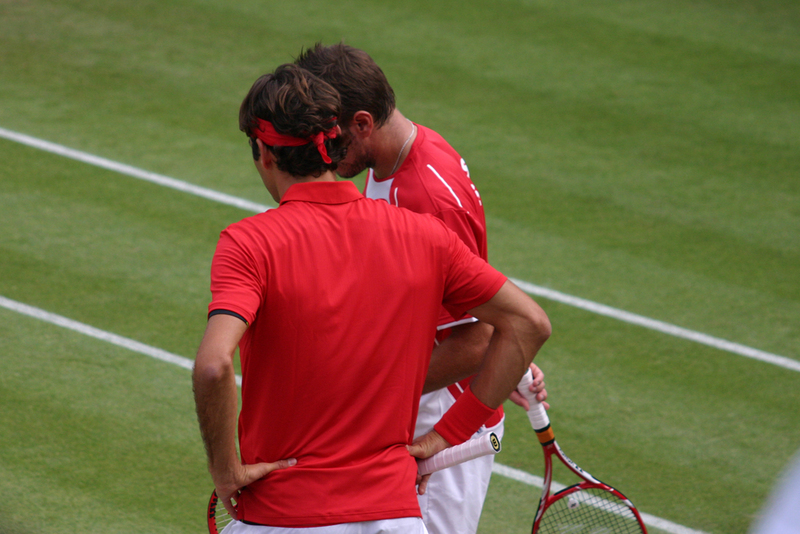 Yes; you know you’re in trouble when the potential of a tiebreak is reassuring. 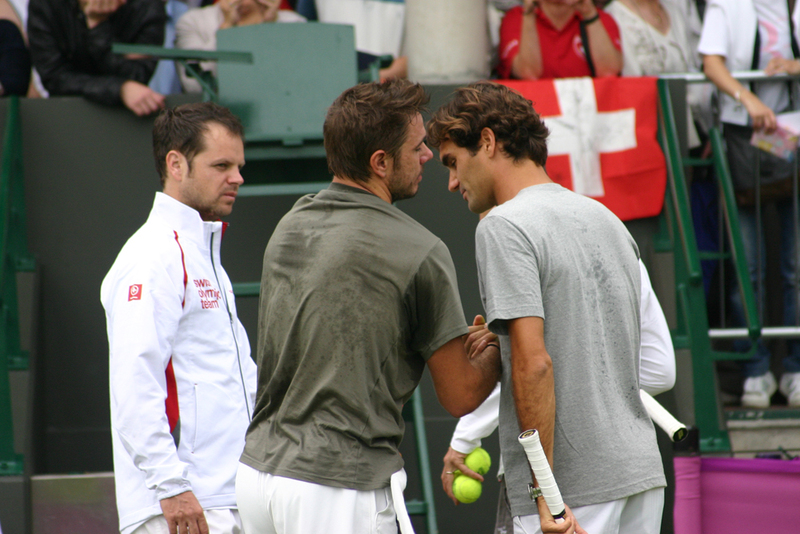 There was nothing to be done as Julien’s audacious winners saved every set point, except marvel at the fact that Roger was never obviously frustrated, and was as ready to fight as we were ready to watch him do it. 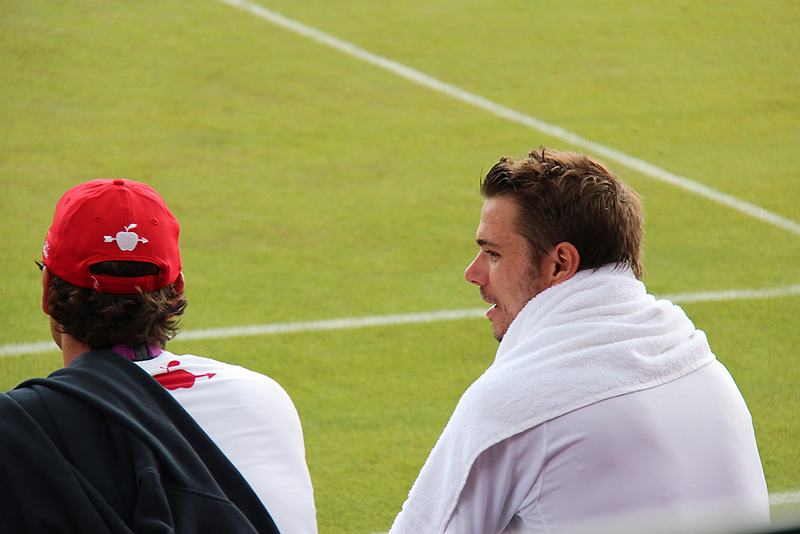 The tiebreak was a brilliant demonstration of Julien’s confidence, and he thoroughly deserved it. 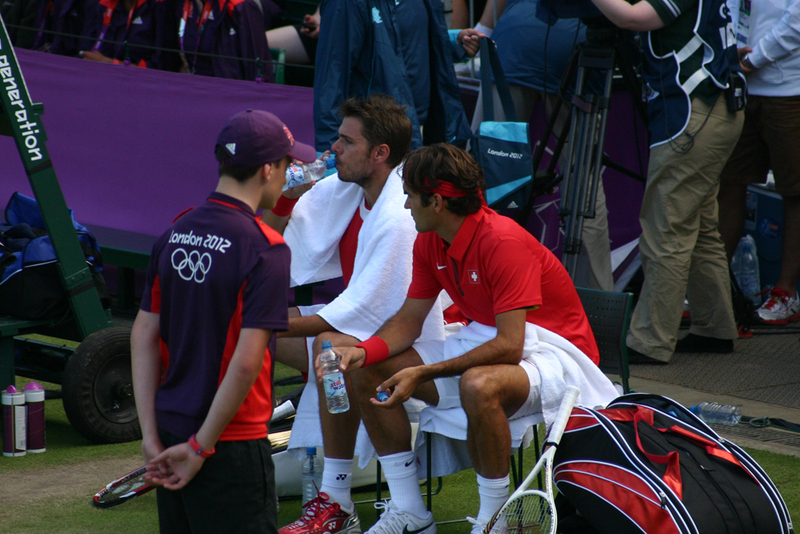 As the two players sat down at the break between the sets, I resolved myself to the fact that I was about to watch Roger lose a match against a brilliant player who had been on fire ever since the start of the match. When you’re watching at home, this would be the point where you might close the laptop screen, switch off the television, make frustrated noises and go and sulk somewhere until you feel that you’ve wasted enough time being disappointed to come back and rejoin the fray. 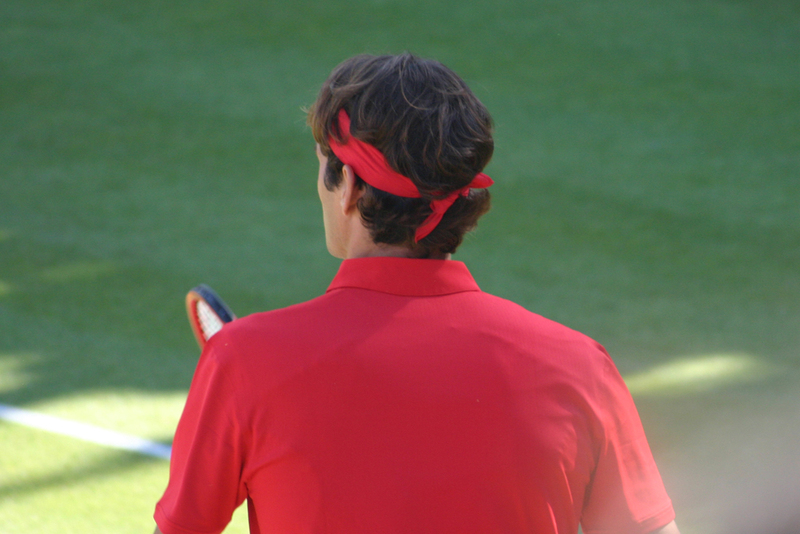 We couldn’t close the laptop screen, because we were right there, and as we were right there and lucky enough to be able to see him play live, we would see it through right to the bitter end, be it a bagel loss in the third or a five set thriller victory right into the night. 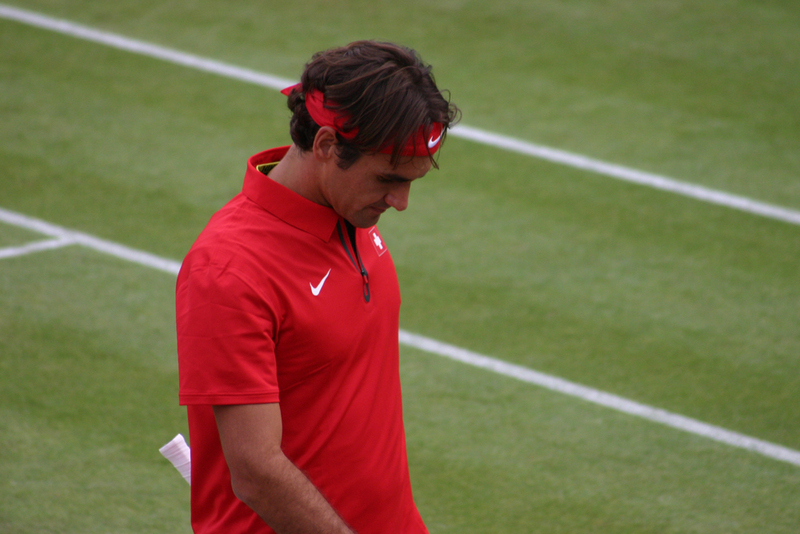 One thing I realised after the match was that when he had lost the first two sets, not once did I, or anyone near me, pause to mention or give thought to the records. 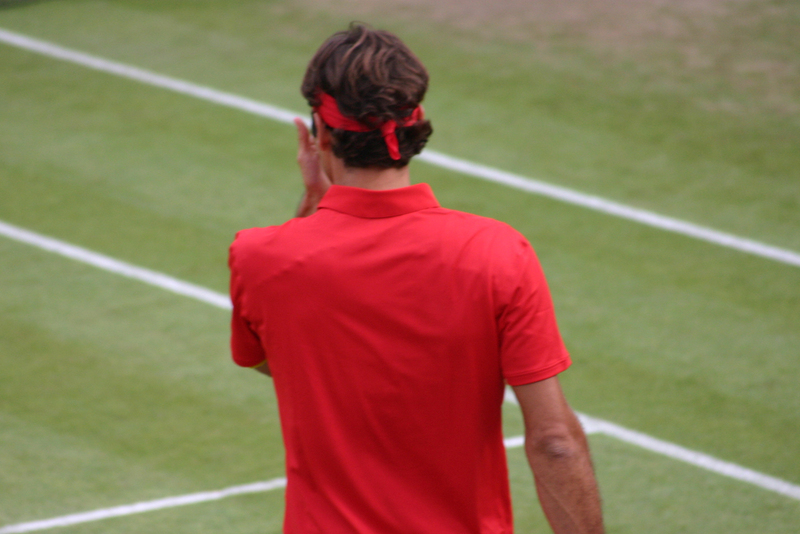 “Oh no, he might be unable to reach his 33rd successive Grand Slam quarter-final, a record which he extended just two weeks ago at the French Open,” was something you certainly did not hear anybody say. 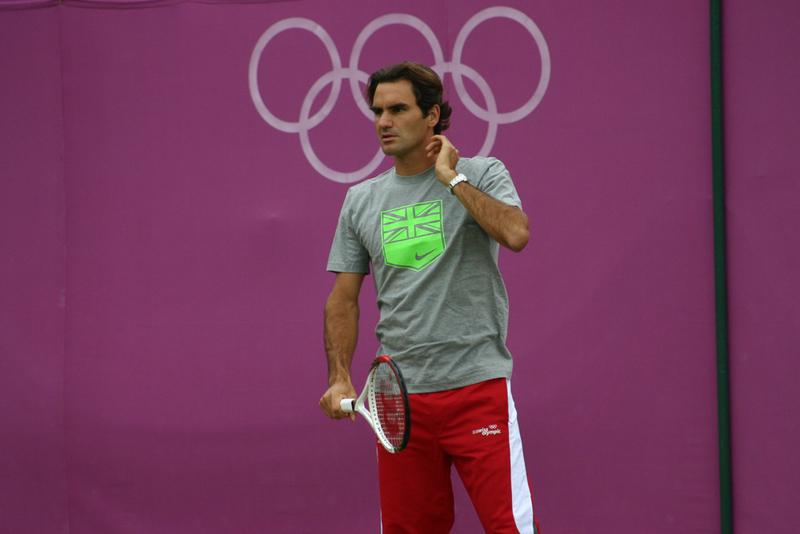 One thing I’ve always believed is that Federer isn’t about the records. Sure, he’s got a bunch of them, and you could spend hours reading them and obsessing over them. 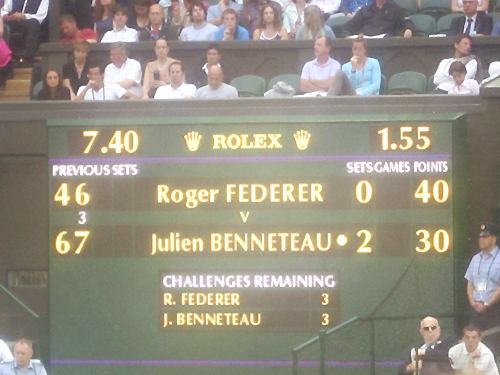 I don’t doubt that commentators were excitedly mentioning at the changeovers that “this would be Federer’s earliest loss at the slams for eleventy-billion years!” but when you’re watching the points it’s the last thing on your mind. 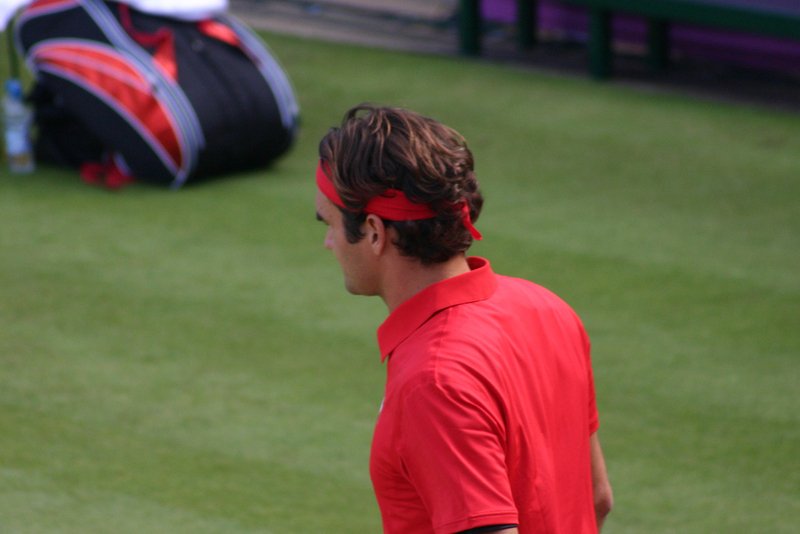 We wanted him to win because we wanted another chance to watch him play on Centre and hit many more whipping forehands and floating backhands and because, however many years he stays on tour, it will never be long enough. So, two sets down. 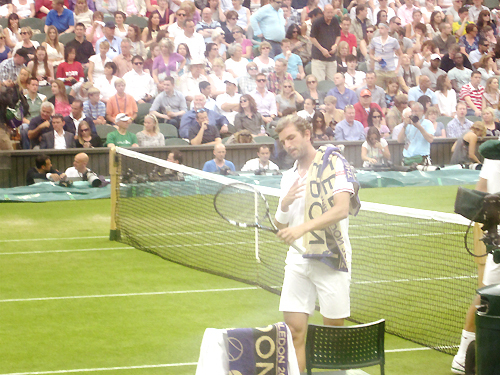 Benneteau was serving, and fell awkwardly. 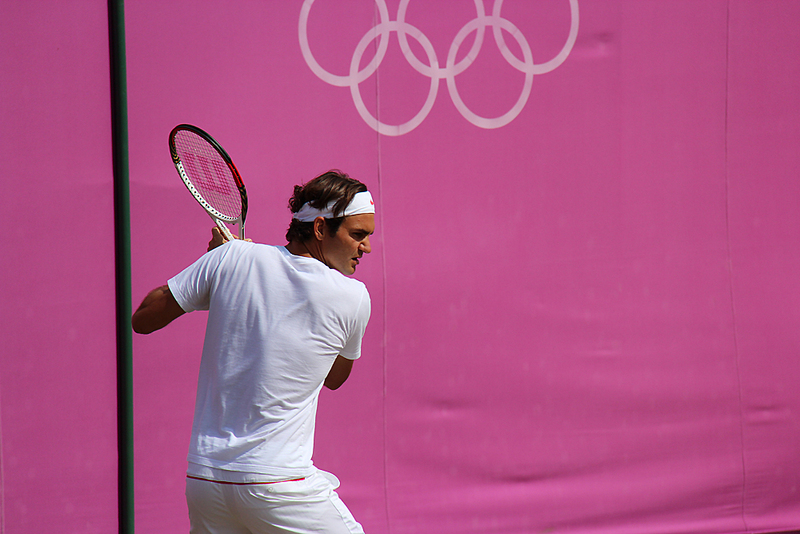 Roger fashioned a break point with a backhand down the line, he broke, he held, and in the blink of an eye he took the third set. This time, he hadn’t flinched. The anticipation was building. 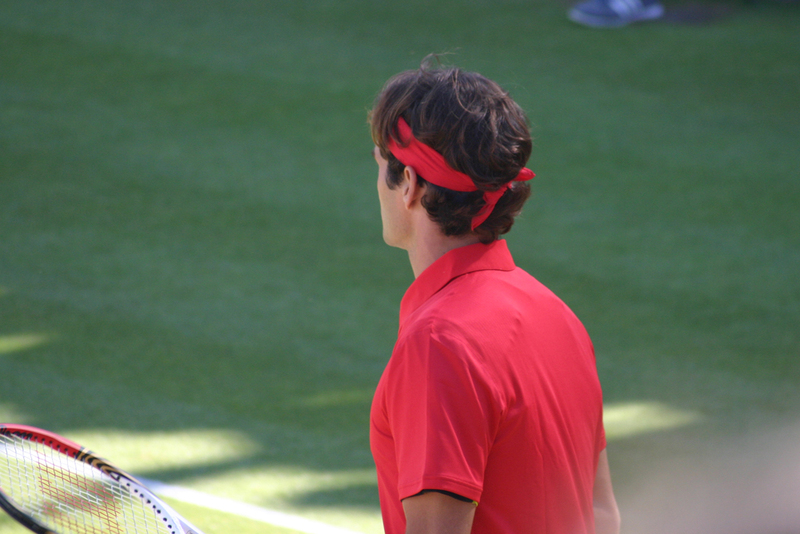 He had served it out to love at *5-2, so there was no doubt that there would be at least a fourth set, but still people stood and applauded him back to his chair. 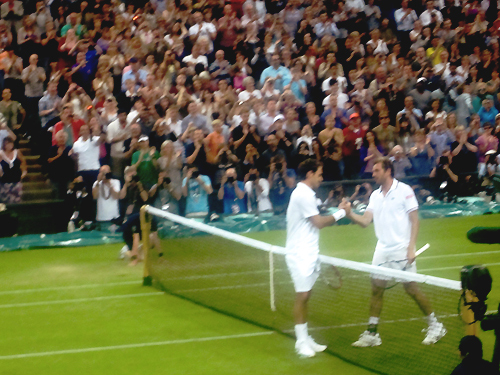 I started to wonder if this might just end up being one of the most incredible evenings of my life as a tennis fan. So, the fourth. The atmosphere in this set was the most unbelievable that I have ever experienced. The aforementioned group of French fans who had been cheering good-naturedly for their compatriot early on were now decidedly in the corner of France’s adopted son instead. Every point crackled with tension. 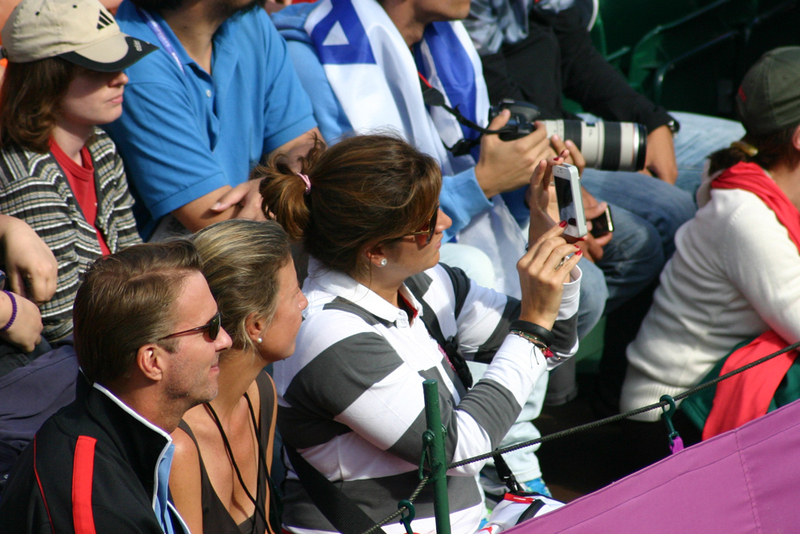 The digital cameras that people had been snapping with earlier on lay forgotten in their laps and nothing could divert our focus from the play, as our eyes followed the ball as it jerked around the court, back and forth, up and down. 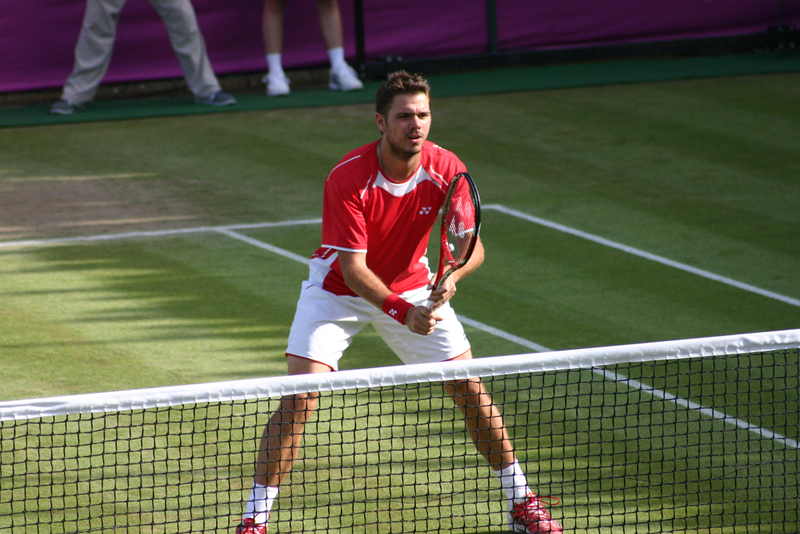 We groaned every time an errant forehand skidded past the baseline; we clapped in disbelief at every impossible winner Julien hit. People would rise half out of their seats for an ace. It was 2-2*, 0-30. 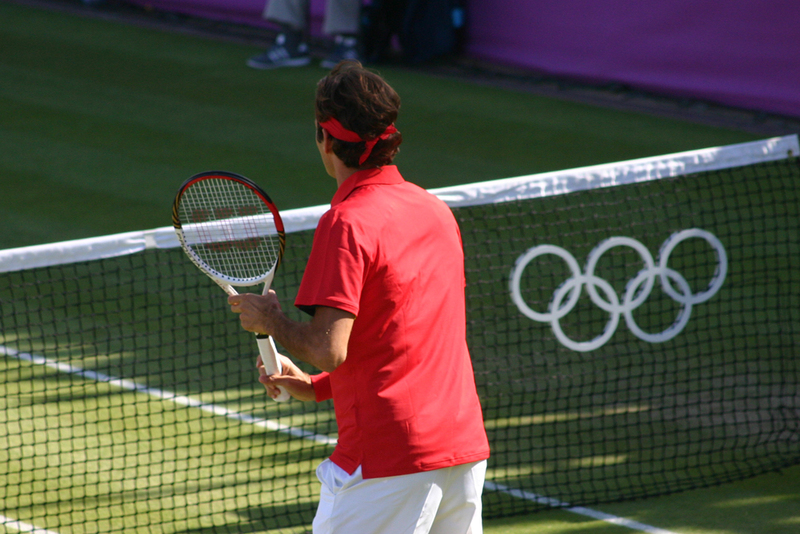 A quick rally, then a faultless backhand from Federer made it 0-40, and he shouted “ALLEZ!” Despite Roger’s propensity to have mental walkabouts on breakpoints, we were now extremely excited. 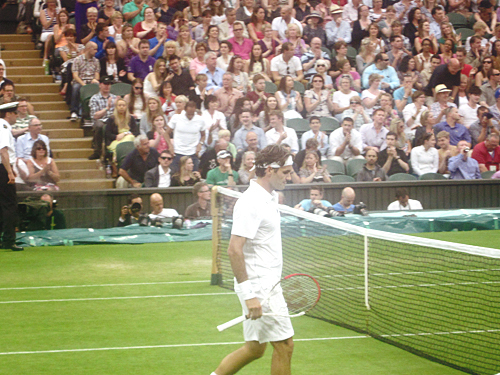 Surely he couldn’t lose the lot; surely a fifth set was coming, and soon, and the momentum would be with him. But it wasn’t to be. Julien saved them all brilliantly. 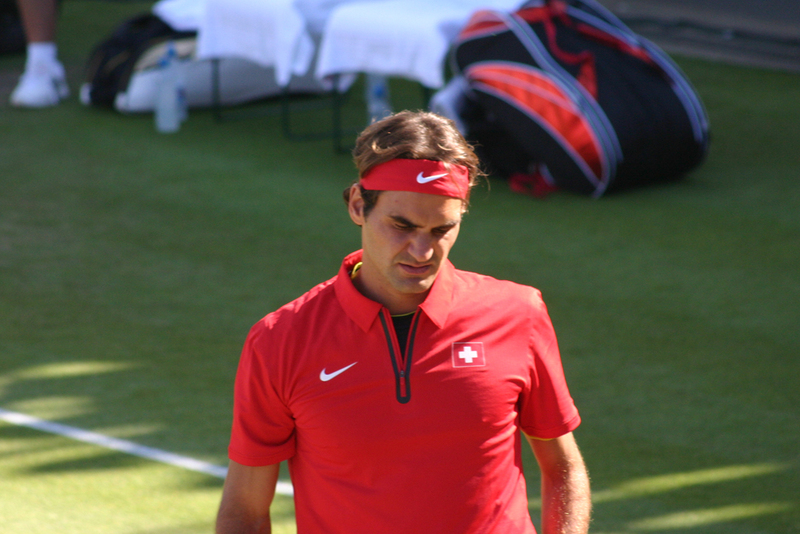 Federer was on the back foot again; how many times have we seen any player, of any rank, waste chances then sink into a dispirited funk, and get broken themselves as a result? 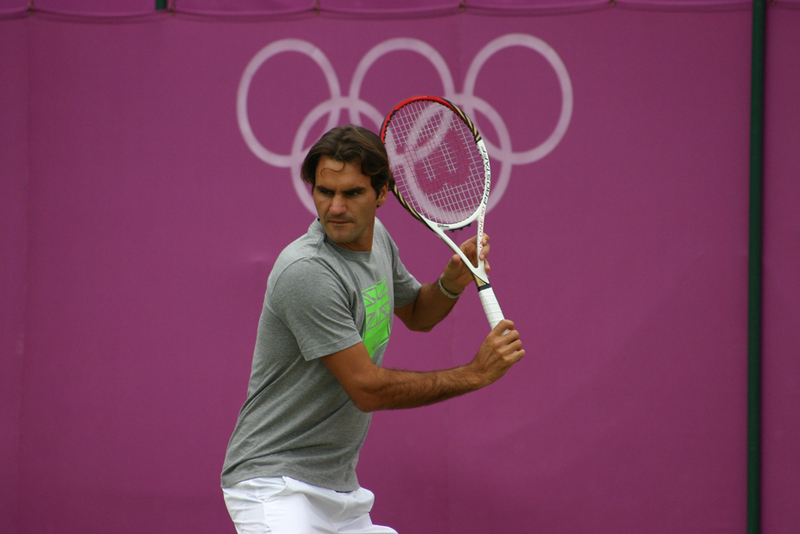 However, it is not for nothing that Roger’s record in deciding sets for 2012 is an incredible 10-1. 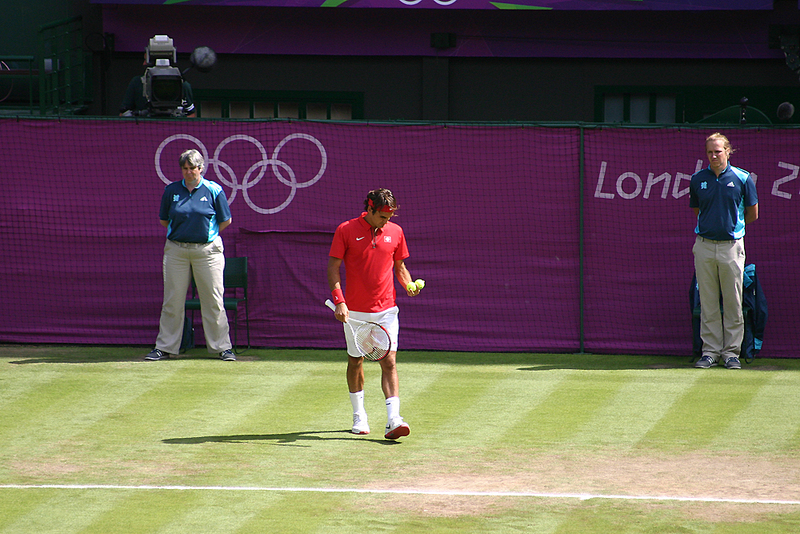 He’s been so incredibly clutch lately, and he wasn’t downhearted, and he held serve without problems. 3-3. Every point now was either a risk or a chance. 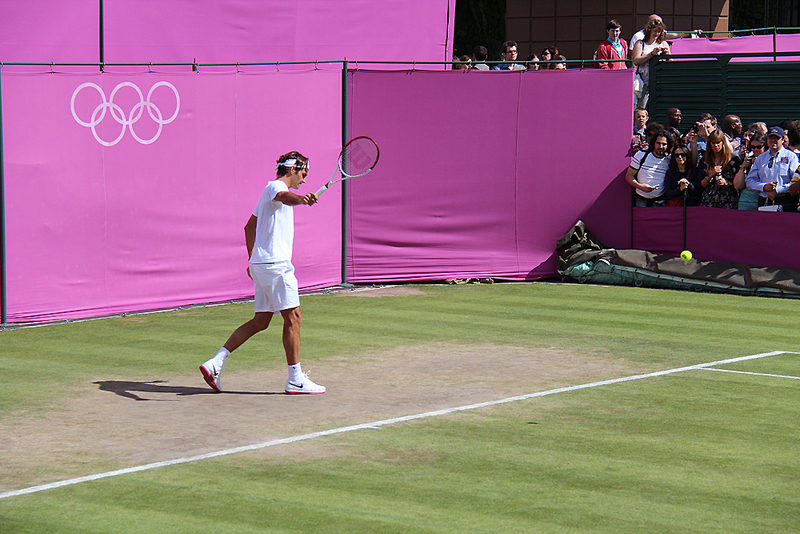 At *3-4, Roger needed to hold, or Benneteau would serve for the match. 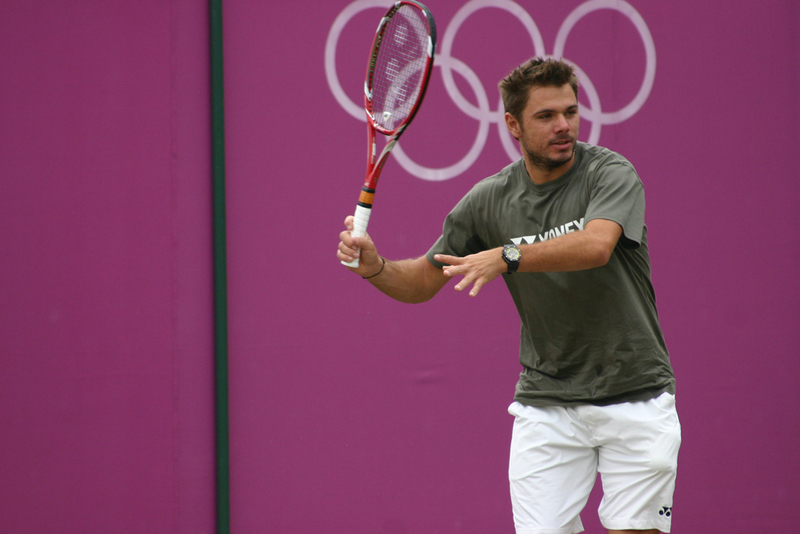 At *4-5 and again *5-6, he served to stay in the Championships. Benneteau was still serving brilliantly, there was nothing Roger could do, and, again, we just had to hope for a tiebreak. 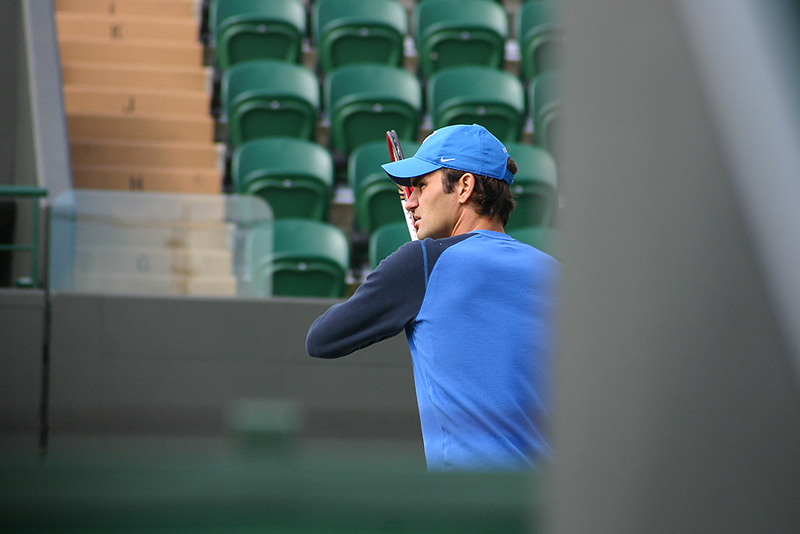 Then, suddenly, Roger wavered. It was *5-6, 15-30. 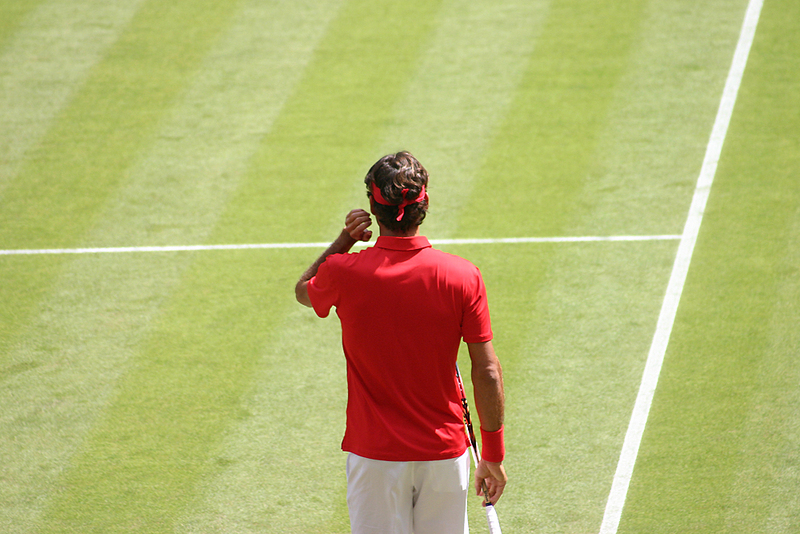 Before the point began we clapped harder than we had ever done before and yelled out encouragement to him, as the voices of the Centre Court crowd rose in a roar, before being hastily shushed as Roger bounced the ball and tucked his hair behind his ears, waiting. 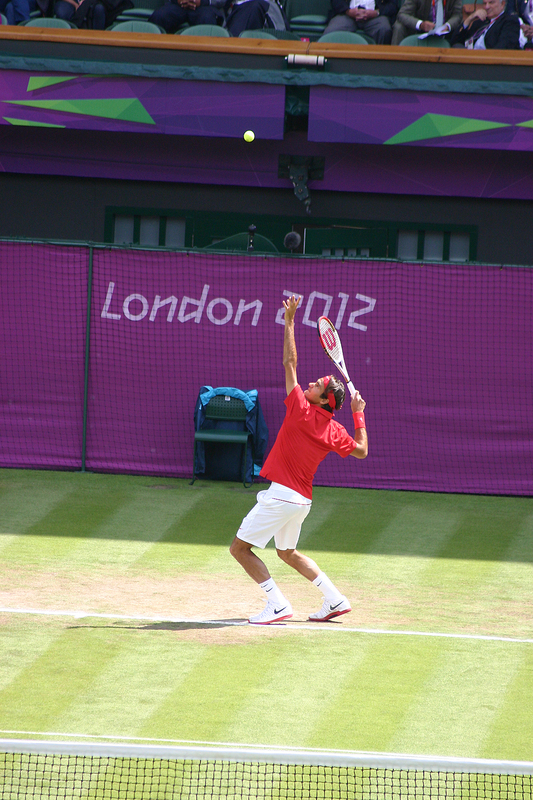 It was a great serve; Benneteau’s reply was short, and Roger thwacked it away for a winner. But he was still two points from going out. He served again; ace. He may have clenched his fist after that, but we were hollering, willing him on. 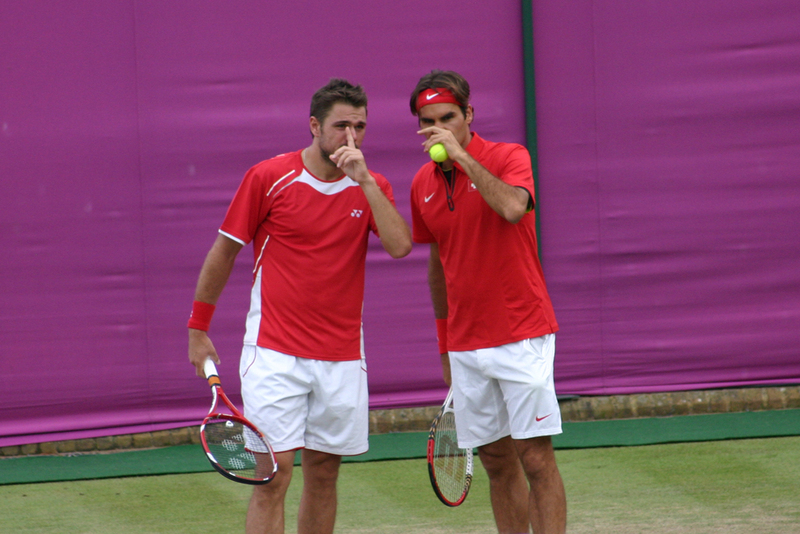 Game point; but Julien got it to deuce. 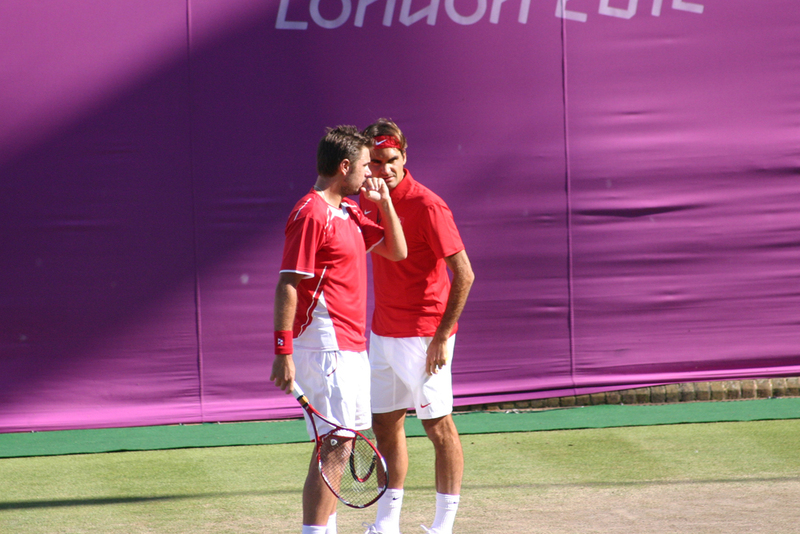 Roger won the next one, advantage; then Julien challenged a backhand of Roger’s that looked long in the next point; it was. Hawkeye was booed. Deuce again. For the fourth time, he was two points from defeat. 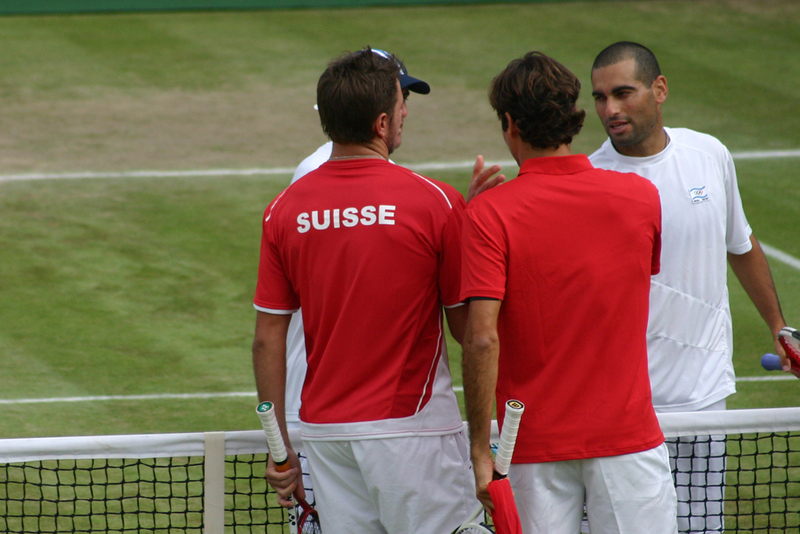 Advantage; the two engaged in a rally, pulling one another from side to side, before a Federer forehand proved too good and Julien’s reply found the net. Game. 6-6. 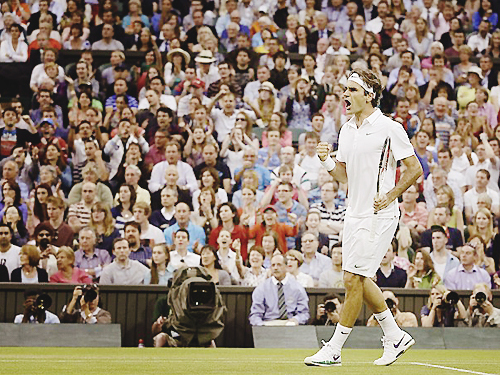 When Federer won that game, the relief was so intense that it felt like he had won already. 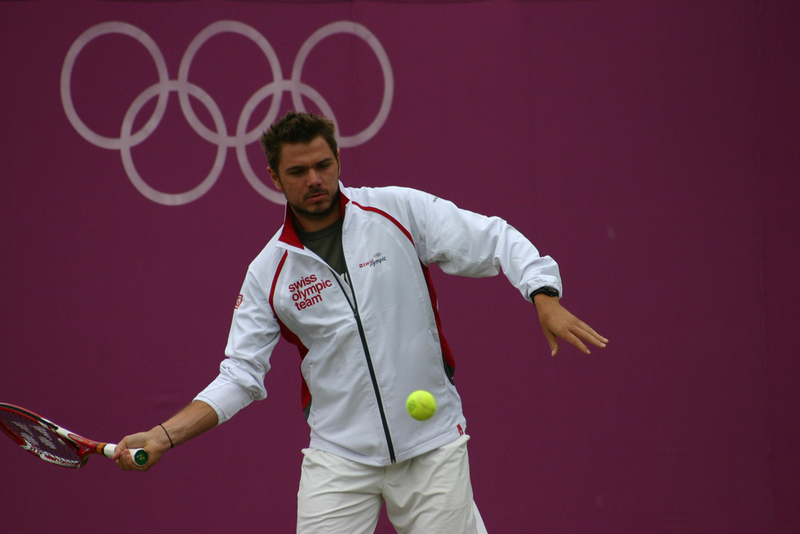 This was the opposite of the second set, where he had squandered his own chances on his opponent’s serve in the twelfth game; this time he had fended off the challenge of Benneteau on his own serve. 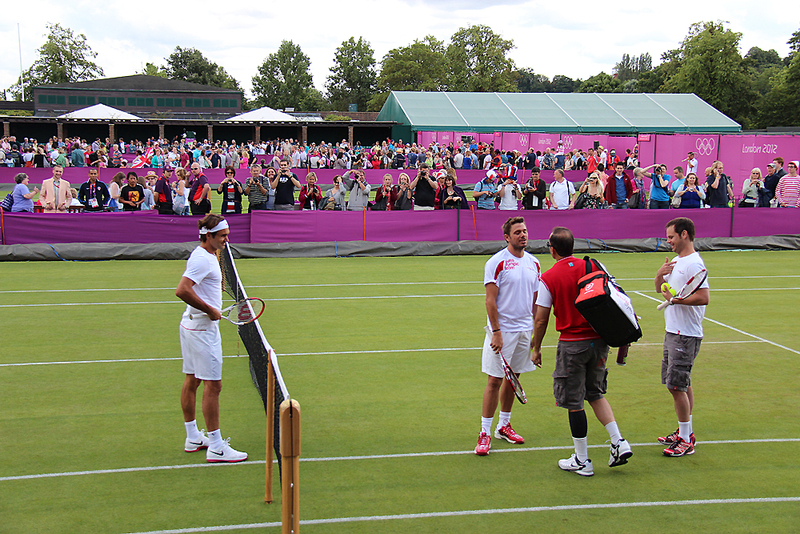 Once again, people rose to their feet in appreciation, anticipating a tiebreak which would be do-or-die. 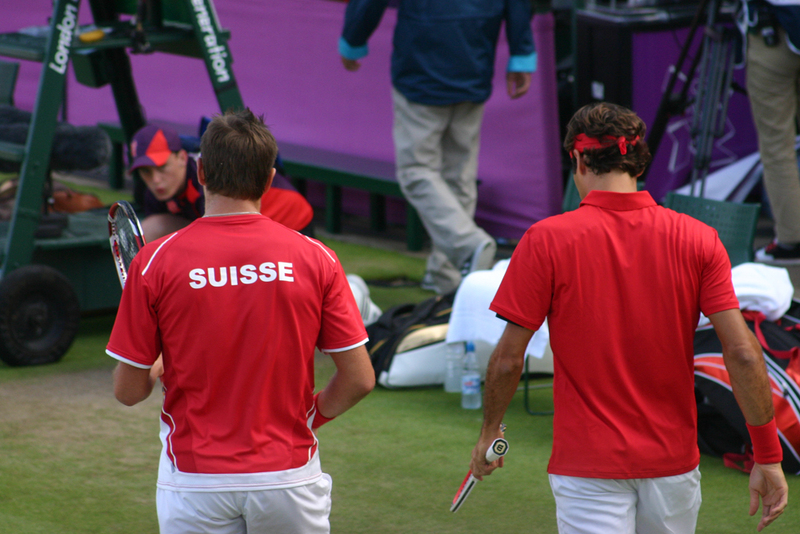 This was to be a tiebreak where we were continually teetering on the brink of hope. 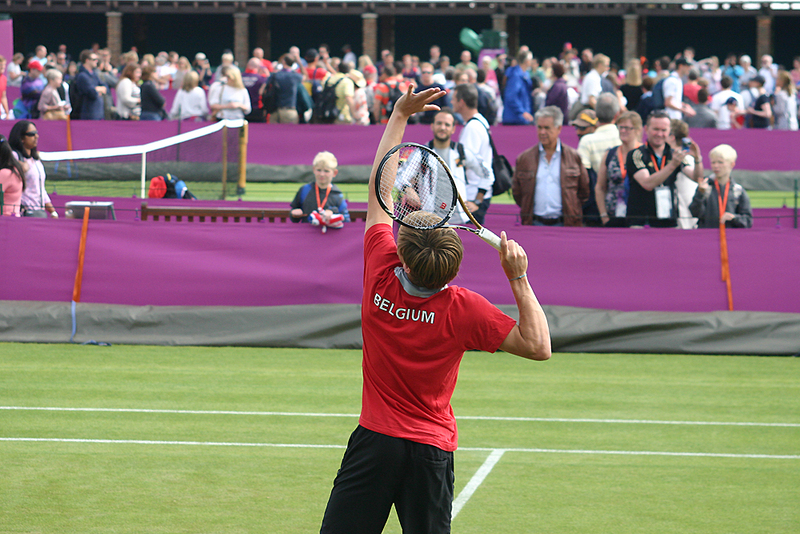 The first point, with Benneteau serving, was a great rally, where each shot nipped past our heads so fast to the extent that we were craning our necks to see around the umpire. 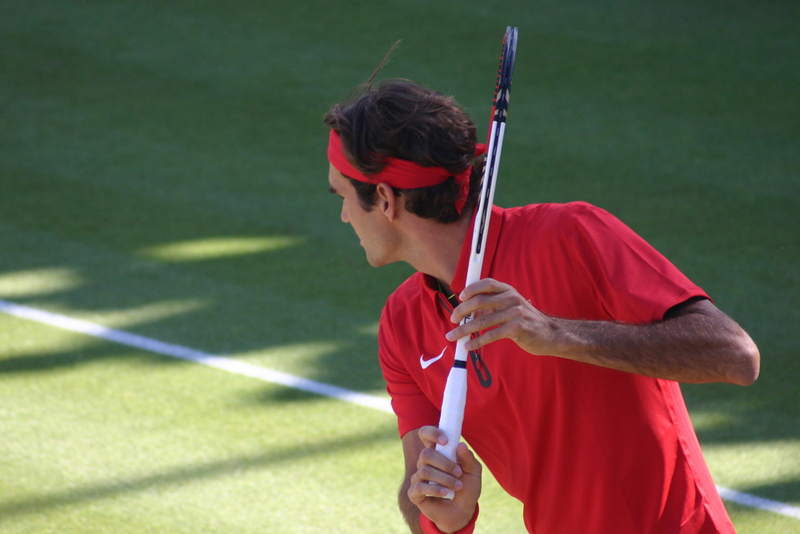 A Federer forehand was just long. 1-0. Roger was next to serve; he made it 2-1* with incredible serving, and cried “ALLEZ!” again, to be echoed by thousands in the audience. 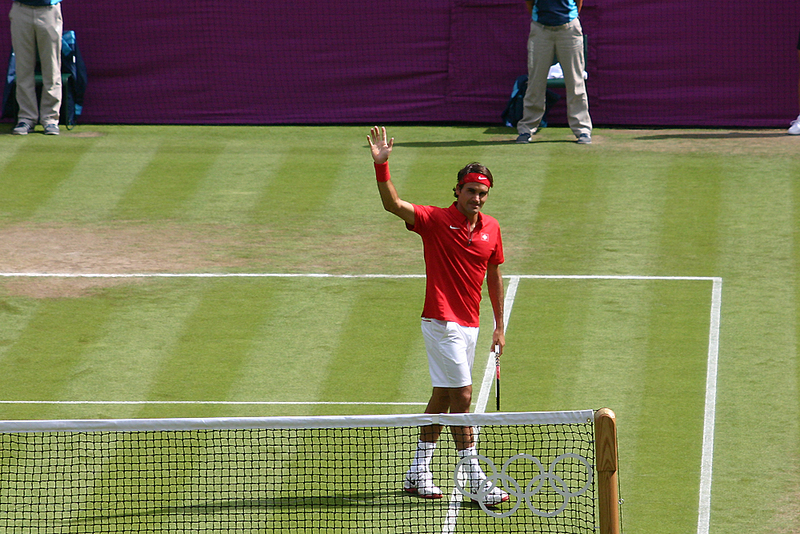 Then, 2-2; and the first mini-break. 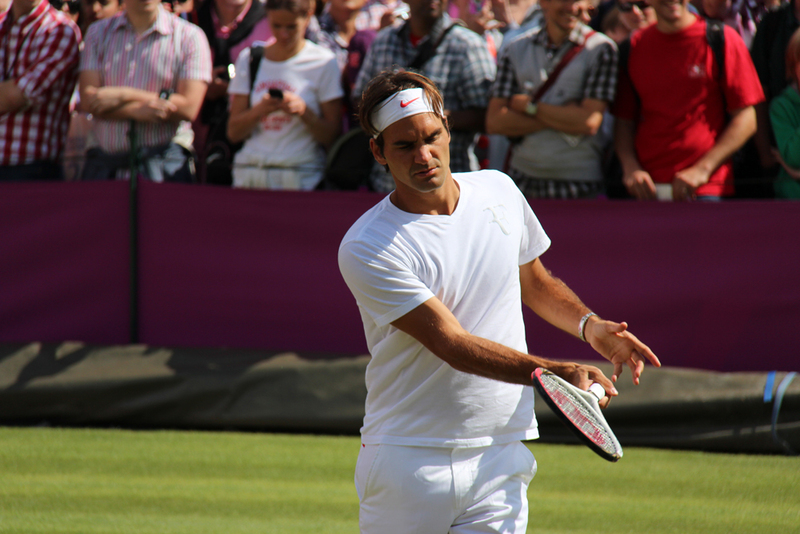 He twisted around to hit a stunning crosscourt forehand; Julien’s reply floated in the air and Roger pounced, racing forward to take it and blast it down for a winner. The roar was deafening. Yet, on the next point, Julien got the mini-break back. 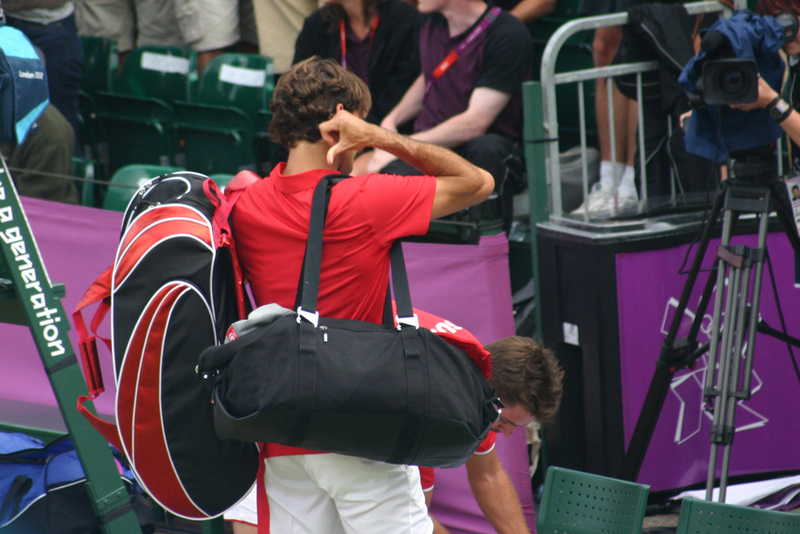 He did the same thing again when Roger got a second mini-break. We were alternately groaning and cheering and applauding, so nervous and excited and caught up in the incredible drama of the match. Nobody wanted it to end. Finally, it was 6-6. 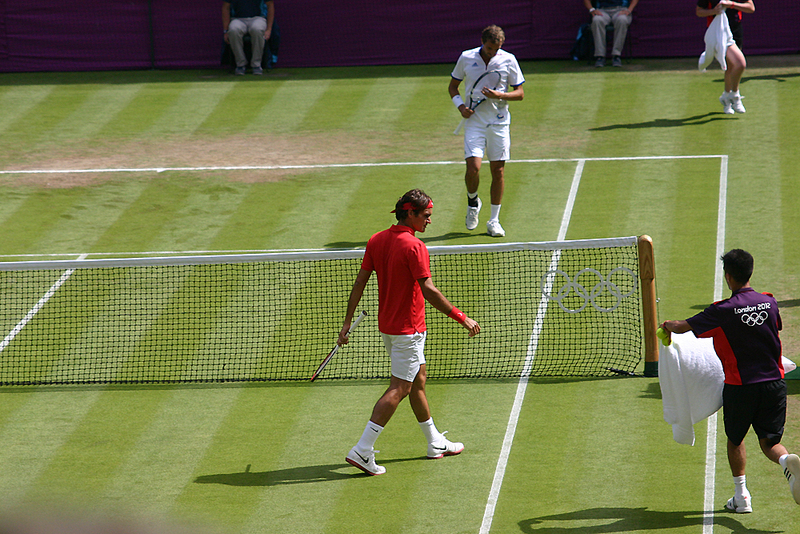 Roger got his third, and final, mini-break, and would serve at *7-6 to take the tiebreak and attempt to give himself a chance to complete his recovery from two sets to love down for the eighth time in his life. 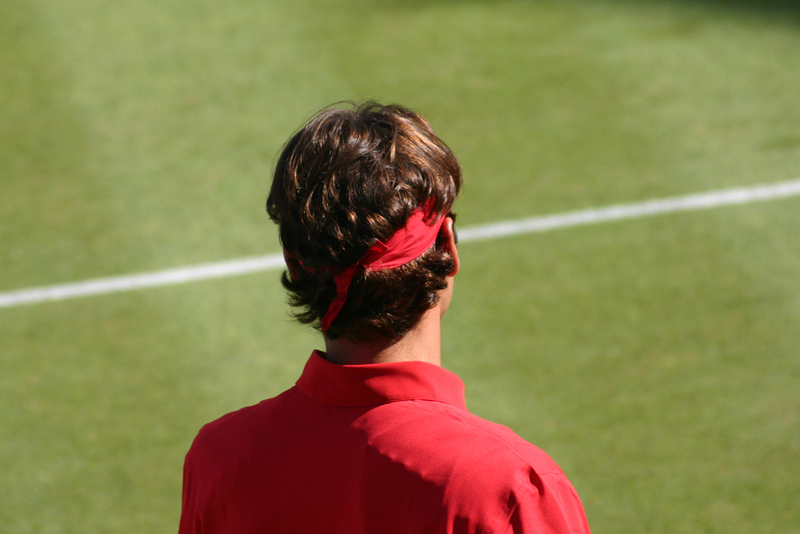 He walked up to the baseline to serve; cheers degenerated into whispers, then electric silence. He bounced the ball. 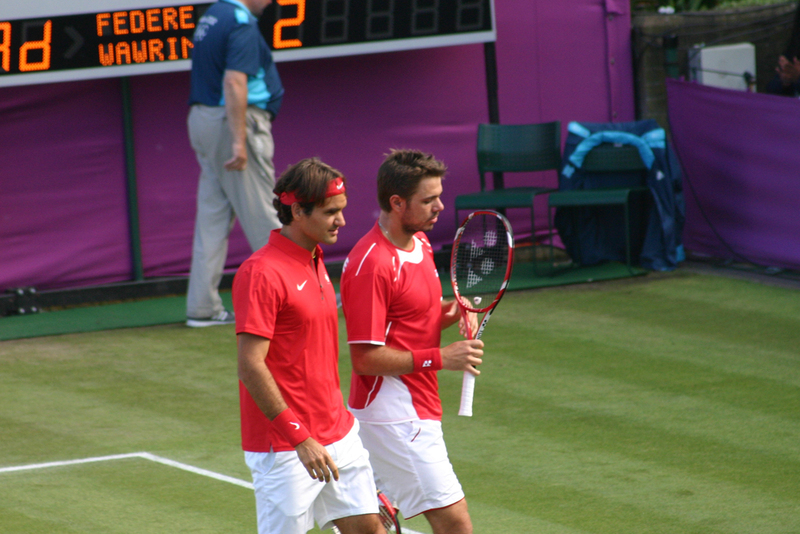 It was a short rally; they pulled one another from side to side, slicing and dicing, then Roger aimed a forehand down the line. Julien ran for it, and couldn’t quite manage a reply. 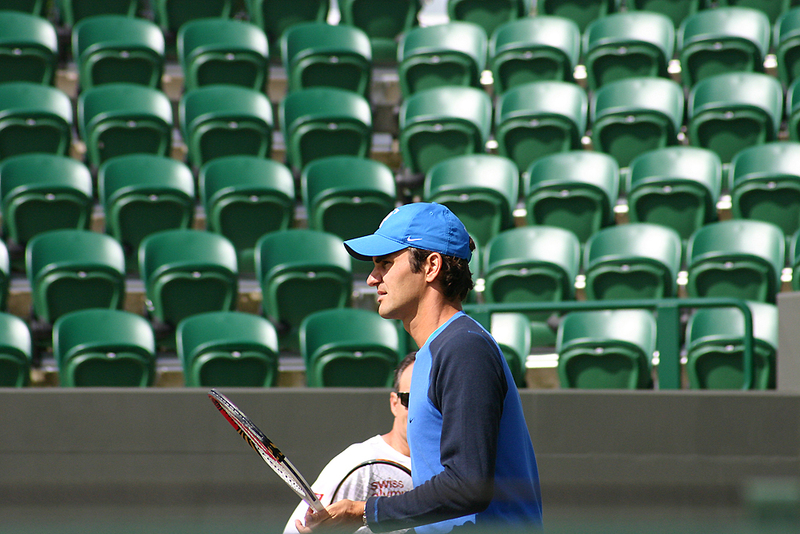 Roger won the tiebreak 8-6, and jogged to his chair with his fist held high. 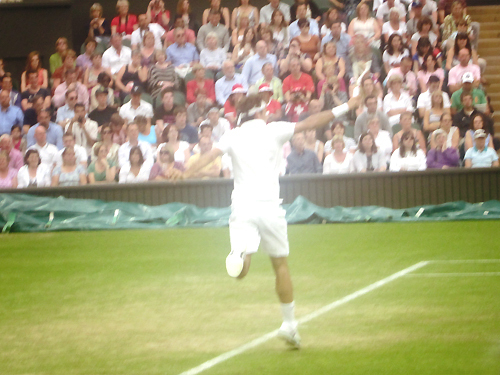 We were jumping around, cheering, amazed, inspired and enthralled. Nobody could have envisaged that the apparently innocent-on-paper third round encounter would turn into this. 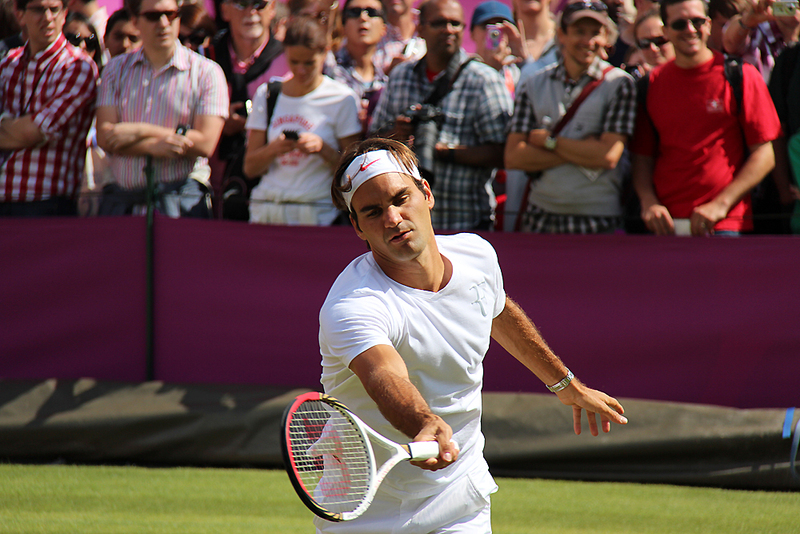 I’ve seen him win in straights five times before, and play beautifully, but now I have to admit that those matches paled in comparison to watch him fight this out. 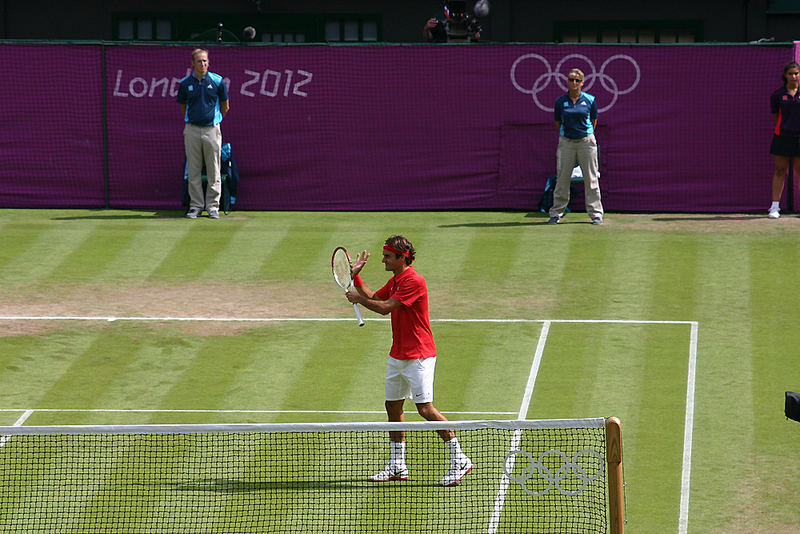 Whatever it would be, a five set loss or a five set victory, it was still the most amazing match I had ever seen live. To all those pundits and commentators who question his desire and his drive and his heart and whether he’s still got “it,” whatever ‘it’ is… well, I hope they were watching this, because it was incredible. 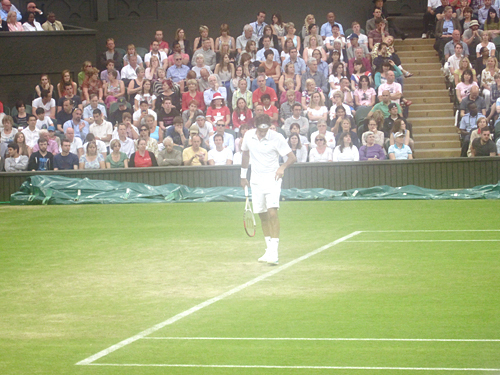 Early in the third set, had I wondered if the match would end up like the Australian Open semi-final 2011; a multitude of wasted chances that ended in straights. 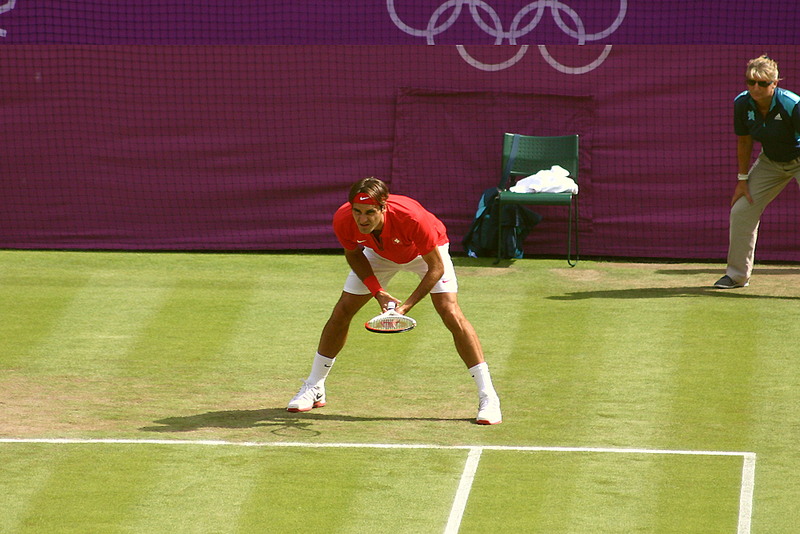 In the fourth set tiebreak, I was reminded of the epic fourth set tiebreak of Roger’s most heroic loss, the famous 2008 final. 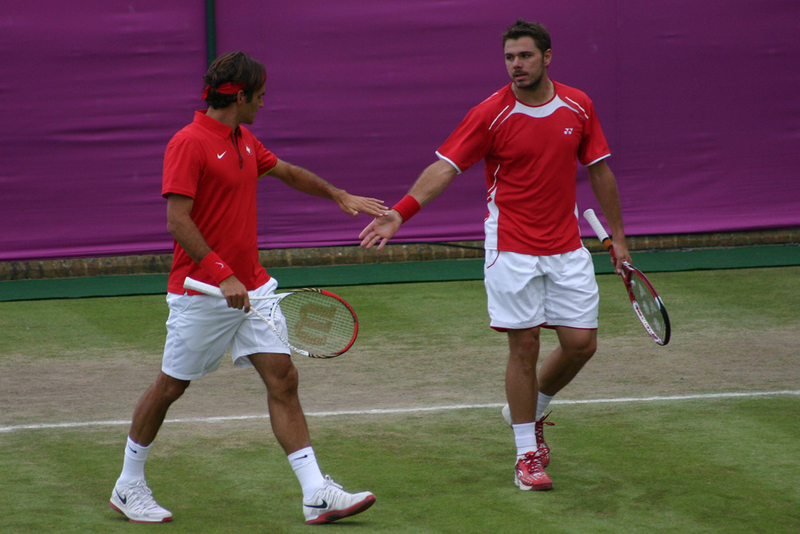 Many are now wondering whether this match will mirror Roger’s fourth round encounter with Tommy Haas the day after Rafa lost at Roland Garros in 2009. 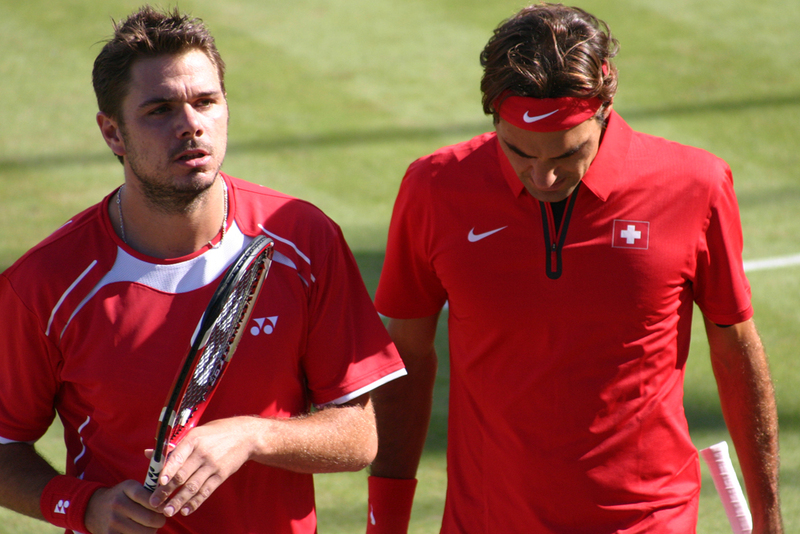 I didn’t have to think back very far when we reached the first game of the final set – I thought of Rosol the night before, and how I had listened in shock to my radio in the campsite as, incredibly, he defied any change in momentum from the fourth set and had broken straight away. It was close in this first game. Every point was a struggle. 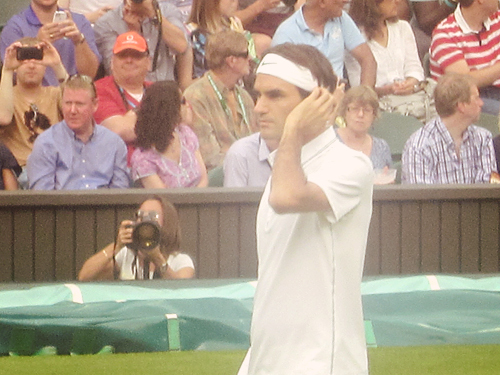 The people around me who had previously offered up moderate applause to both players in the first two sets were now solidly fistpumping and yelling for Roger far more than the man himself, who still appeared infuriatingly, brilliantly calm. 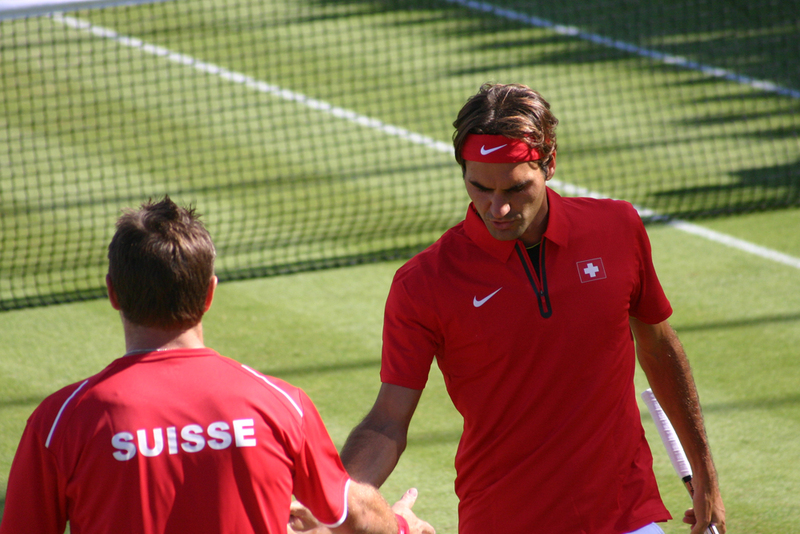 In the end, our worries came to nothing; with a Samprasesque smash, Roger held. Then, the break came quickly. 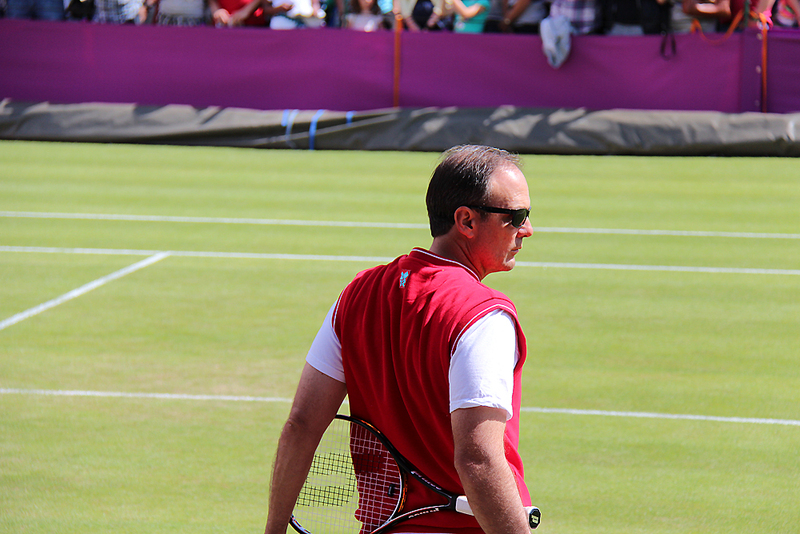 Benneteau was suffering from cramps towards the end, which was a shame. He had fought so heroically, and in no way deserved to lose. He tried a tweener towards the end, and though he missed it, the crowd appreciated the effort all the same, and gave him a very warm ovation. 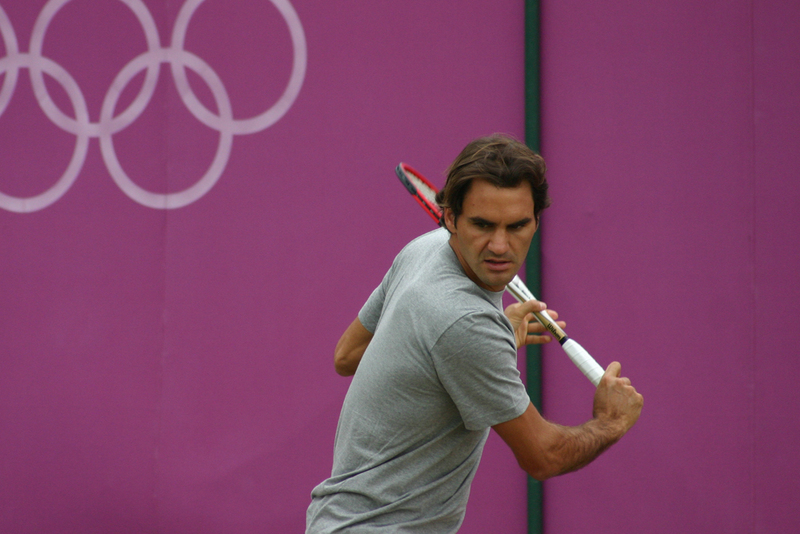 He, like Roger, will soon be 31, and yet is still seeded, and was still playing with passion and determination right until the very end, despite whatever physical issues he had. 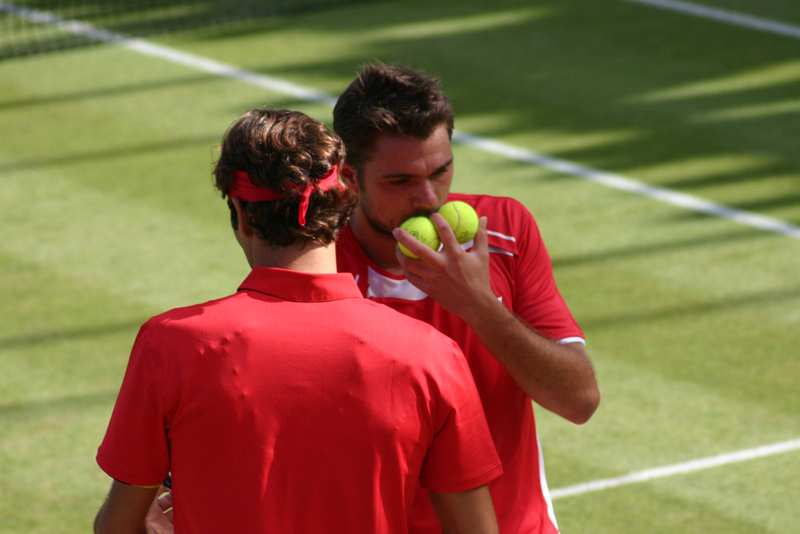 To have recovered from a recent horrible elbow injury and to still make it within a set of the fourth round at Wimbledon… there aren’t many who can say they have done that. 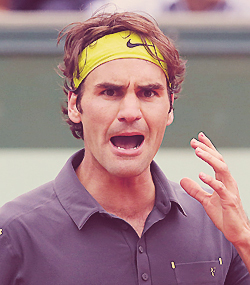 Roger got the double break for *5-1 and, finally, we knew the end was near. 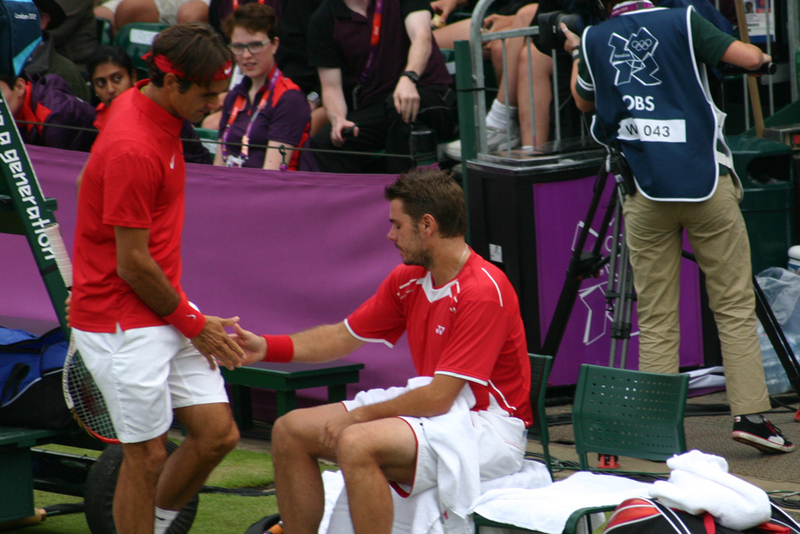 The cheers that greeted every closing shot were in appreciation not of any particular winner, but of the cumulative effort displayed by both men throughout the match; the brilliance of Benneteau and the resilience of Roger. 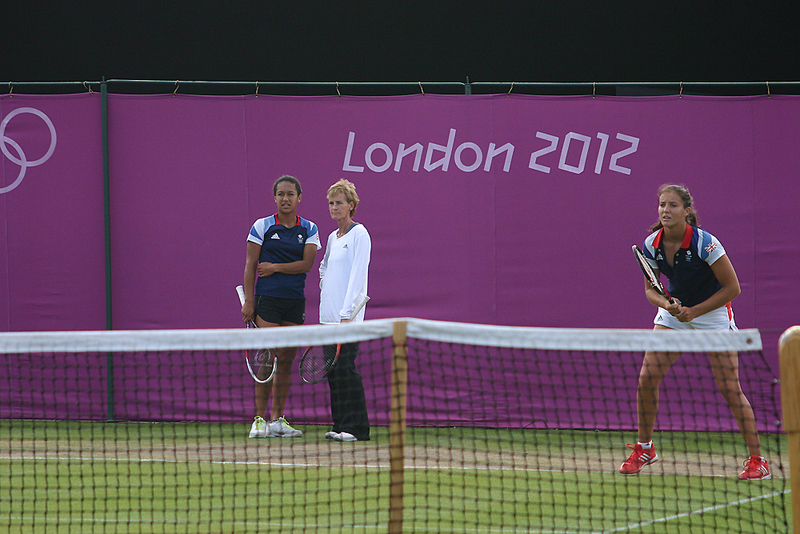 Then, three match points. 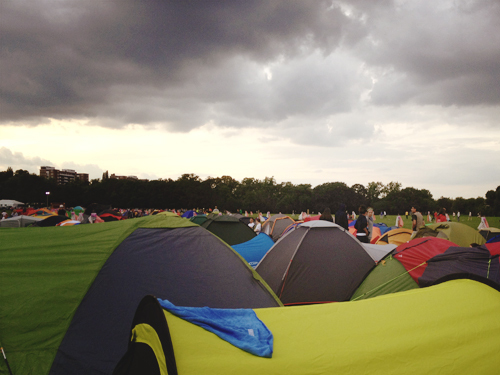 We cheered and whistled, the noise built to a crescendo. 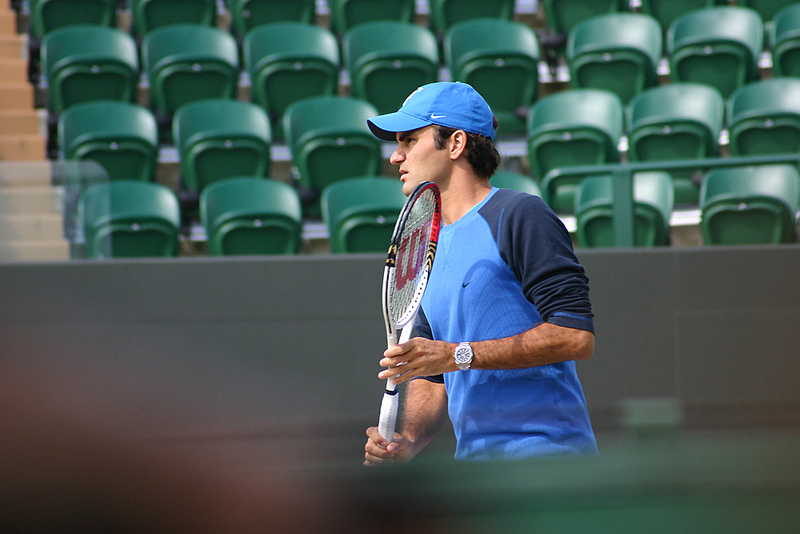 Roger fired a serve up the T. Julien got it back and waited, watching as Roger smacked a forehand into the furthest corner of the ad court, before his own reply sunk into the bottom of the net. It was over. The standing ovation was immediate. 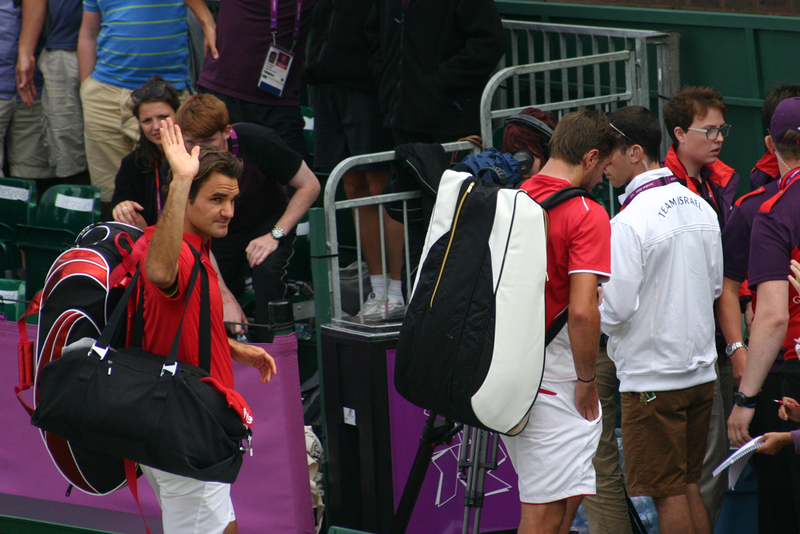 The two players met at the net in a lovely handshake, before Roger walked back into the centre of Centre Court, smiling as we applauded him one last time. 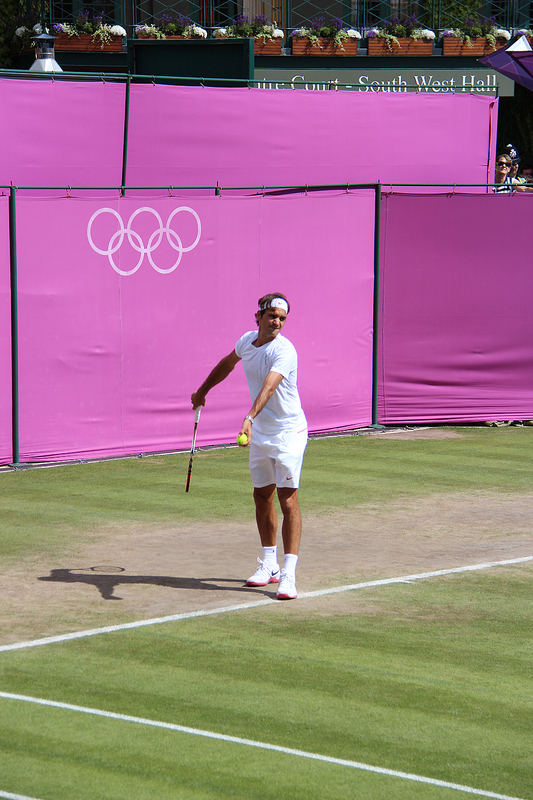 Today, Roger pulled off an improbable comeback against Juan Martin del Potro, rallying from two sets down to win 3-6, 6-7(4), 6-2, 6-0, 6-3 in five sets. 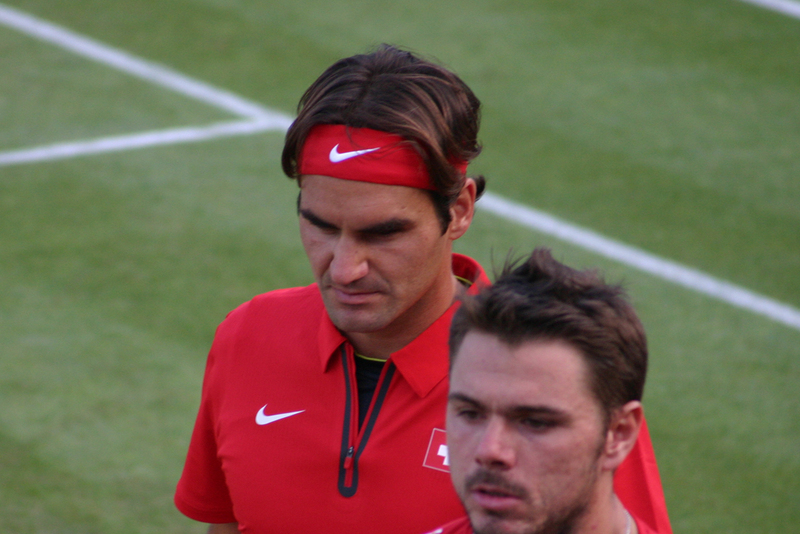 I, like I many others I expect, had almost given up hope, and so it was incredible to see him progress to his 31st Grand Slam semi-final – a record, again, shared with Jimmy Connors. Q: You were born very close to the French/Swiss border. Are you certain you were born in Switzerland? Q. 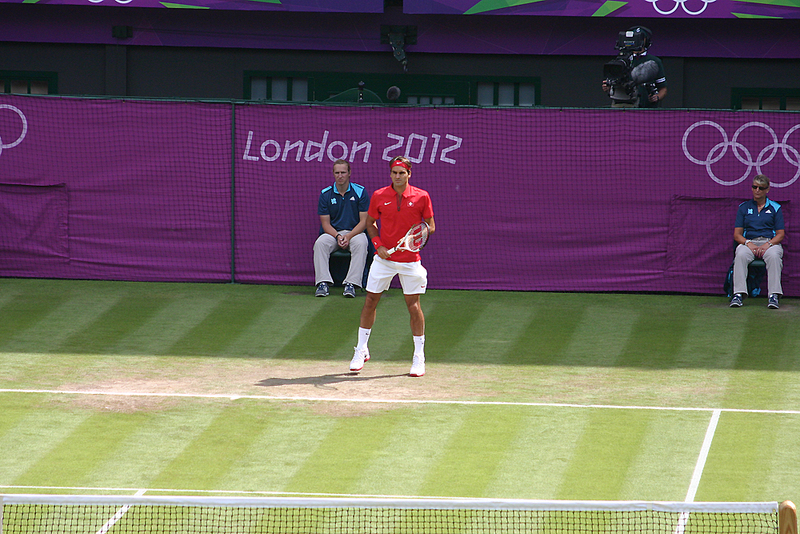 This was a complicated match, but do you think you can raise your level to defeat Djokovic as you did last year? Q. 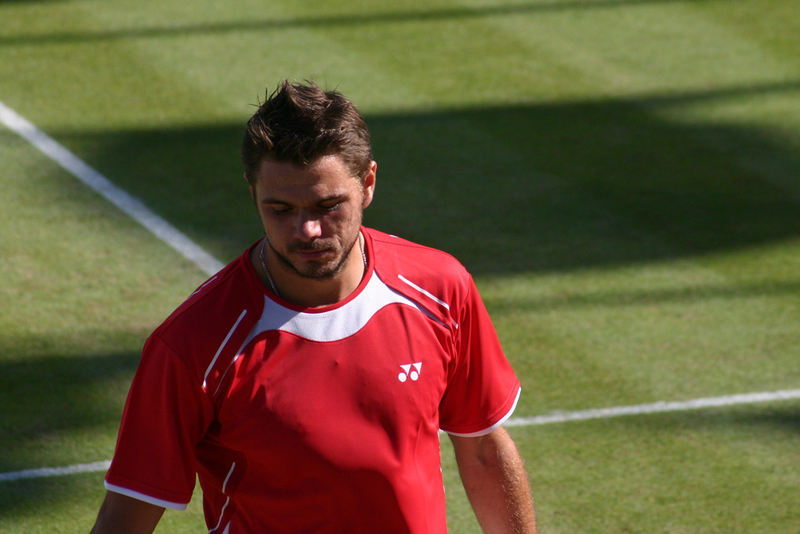 You lost to Tsonga in five sets in Wimbledon. 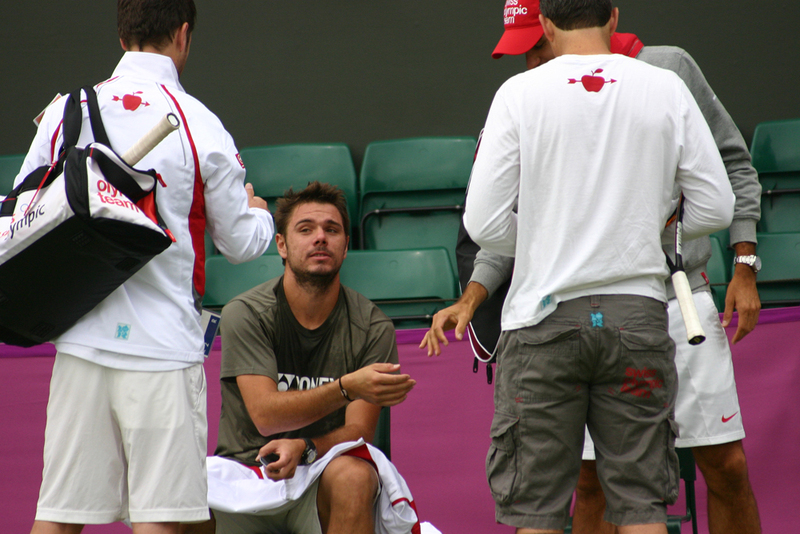 You also lost to Djokovic in five sets. 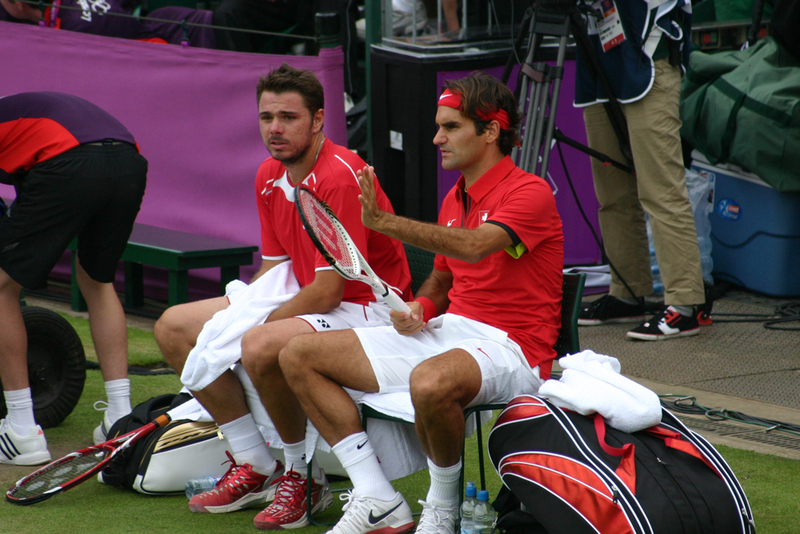 Would this victory in five sets confirm that you can win a match in five sets? 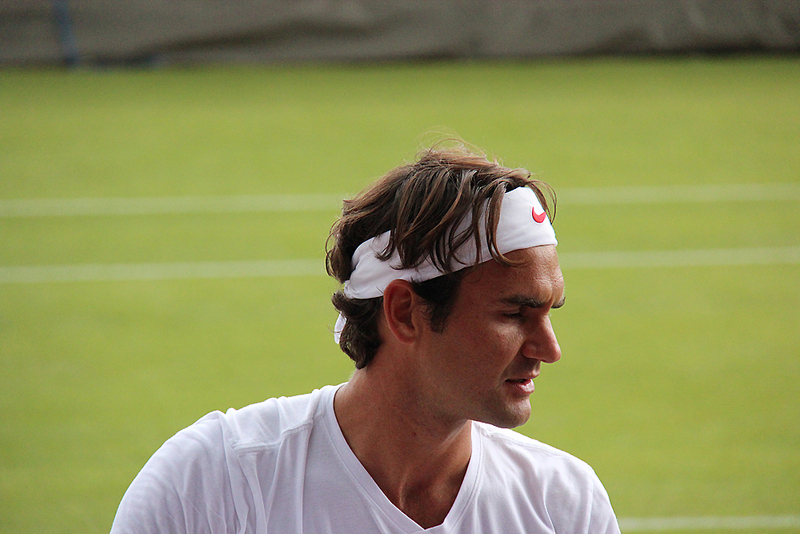 The slightly inane nature of these questions brought me back to a series of quotes from Federer’s press conferences that I have compiled over the years, and so I decided to repost them here. Read on at your leisure…. Q: What was the last question you didn’t expect and what was the question and what did you answer and when? Do you remember? 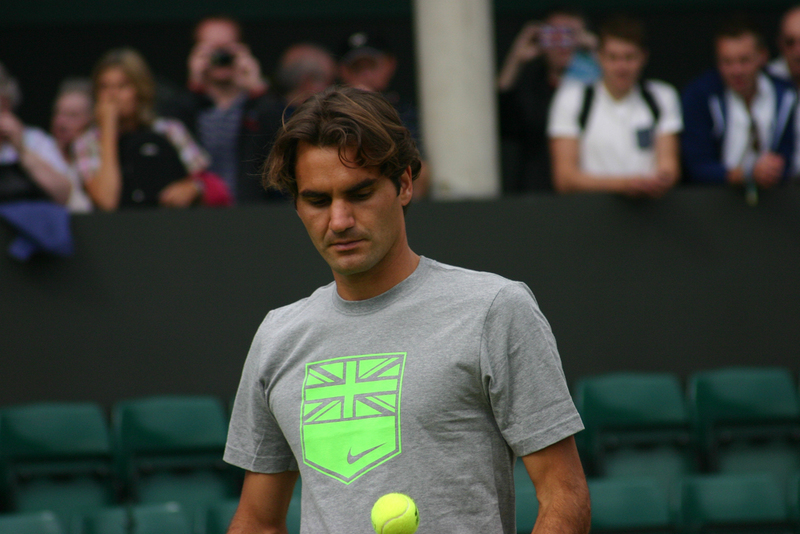 Roger Federer: Don’t know. Maybe one of yours. I don’t know. 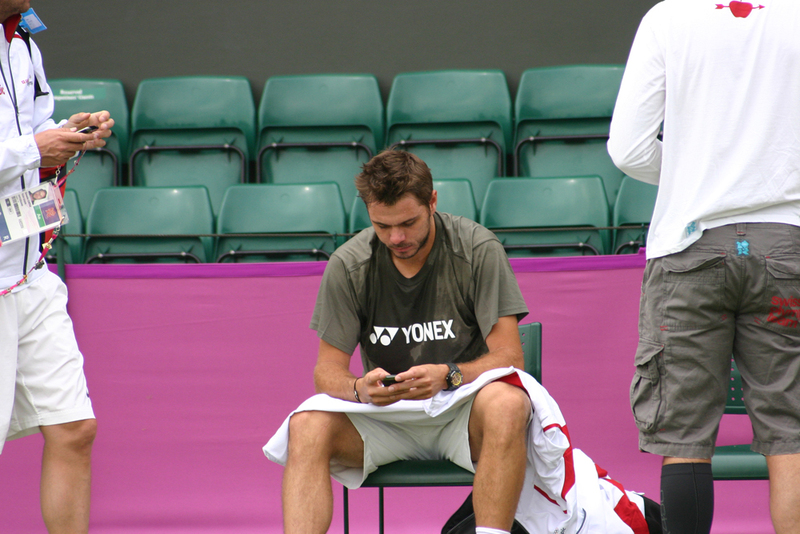 Q: Are you missing Nadal at this tournament? 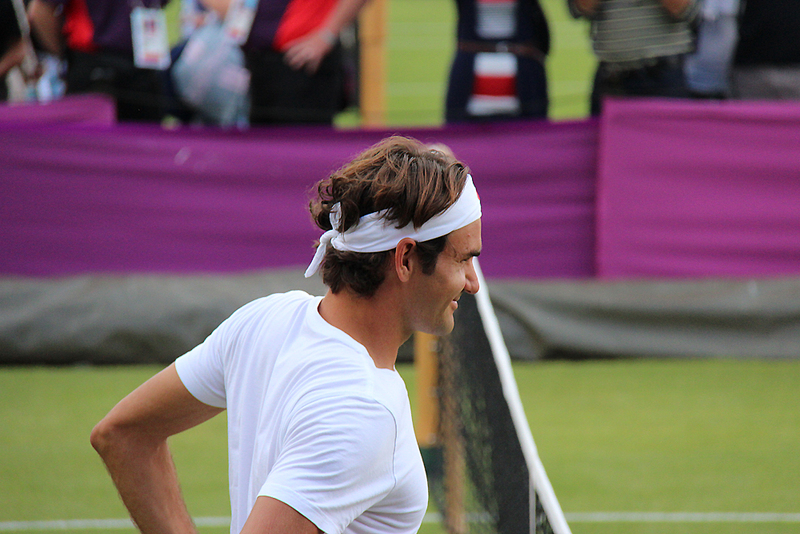 Roger Federer: We’re not dating, so no. 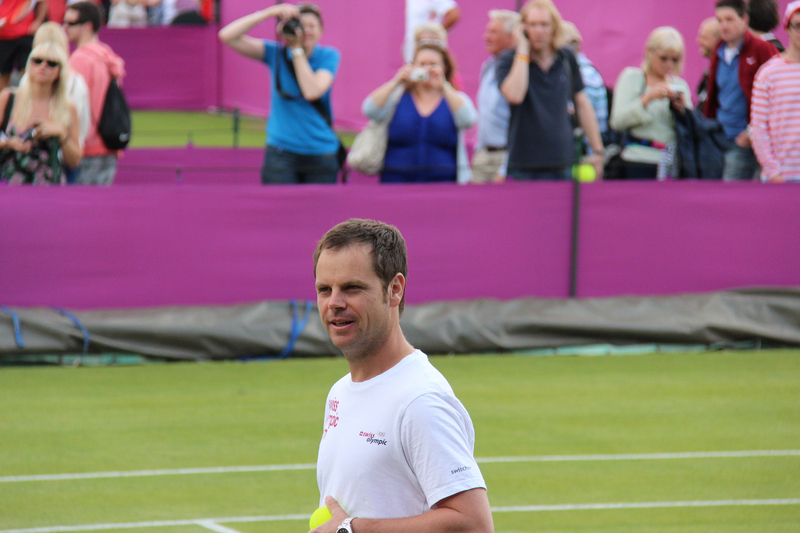 Q: Talking about legends, in 2003 you managed to beat Pete Sampras at Wimbledon. He was an icon at that time. Q: You’re on the official car this year. 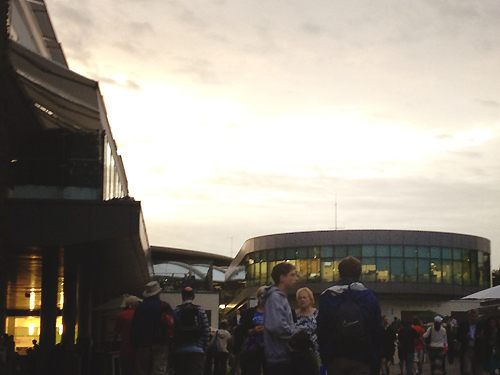 How does it feel to see yourself on the move every day? Q: Have you ever been recognised in strange places? 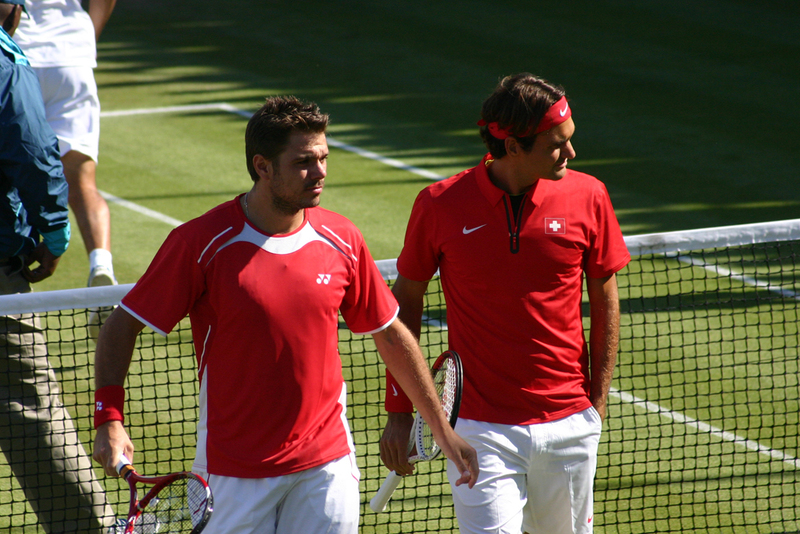 Roger Federer: Yeah, I remember this one time when I went on vacation on the Maldives. That was in the year 2001, I think. I went to this spa. This guy goes, “ahh, I remember you. 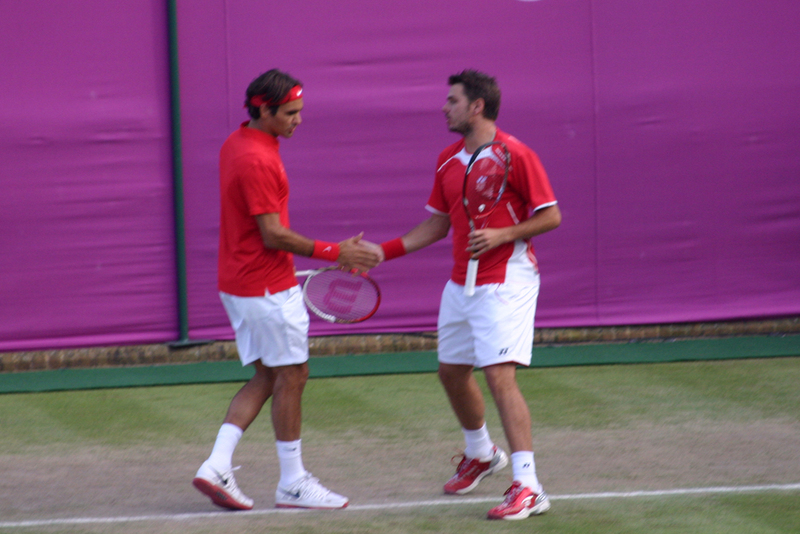 You beat Sampras. I saw you on TV.” I was a little bit shocked. 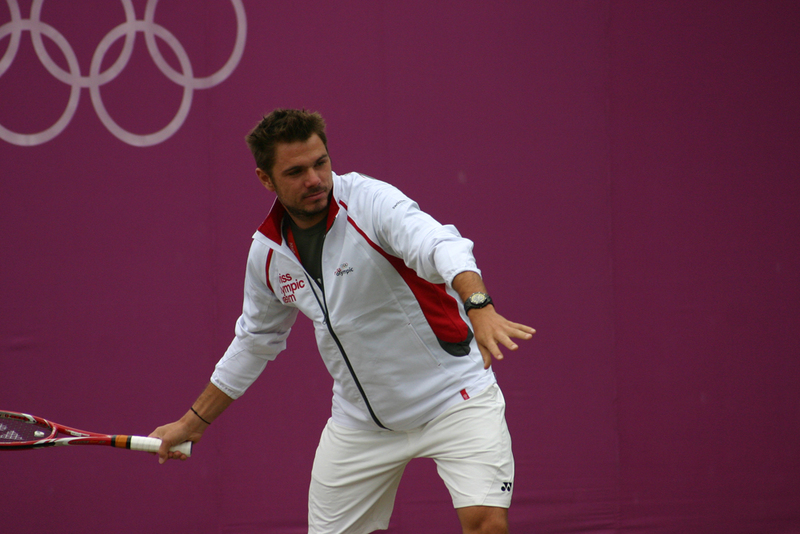 Then I went to play tennis with him because he was actually the tennis teacher. It was nice. Q: Were you naked at the time in the spa? 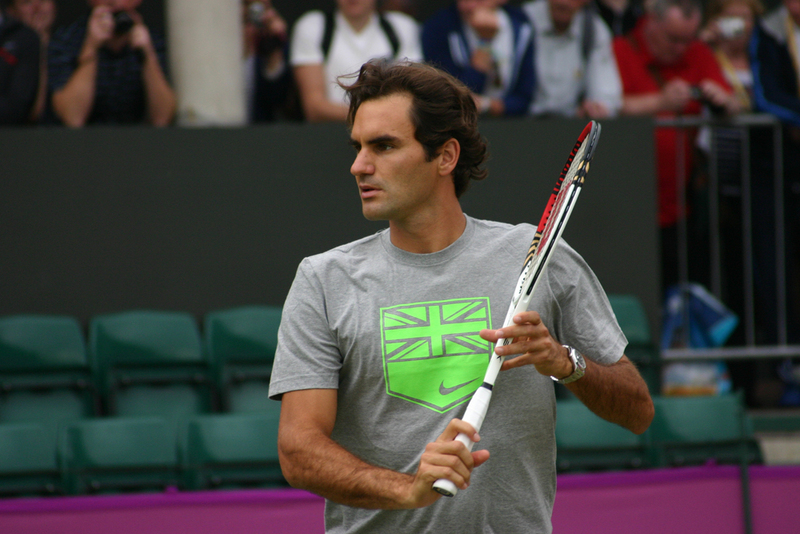 Roger Federer: No. It was at the front desk. I didn’t walk in naked. 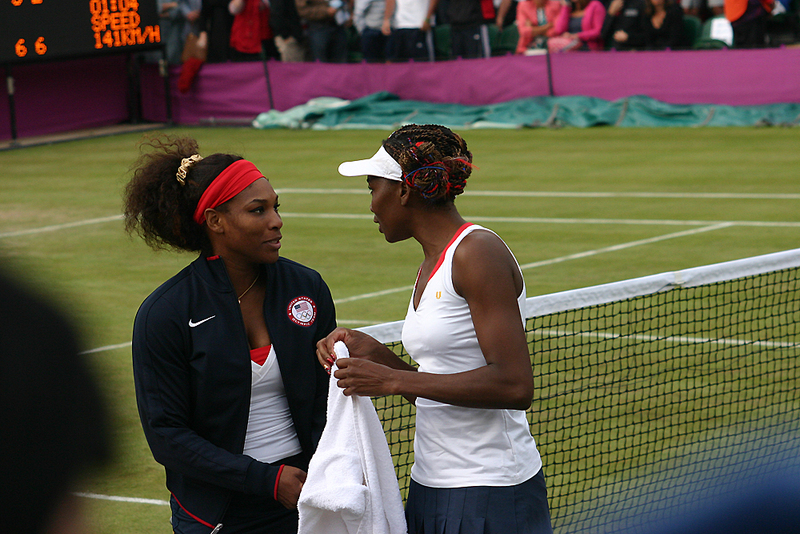 Q: Before you make the challenge there’s a picture of two players on the court. Yours was red and black and blurry. It’s just not very flattering. Perhaps you could change the quality of the picture? Q: Is there any chance of getting one of your towels? 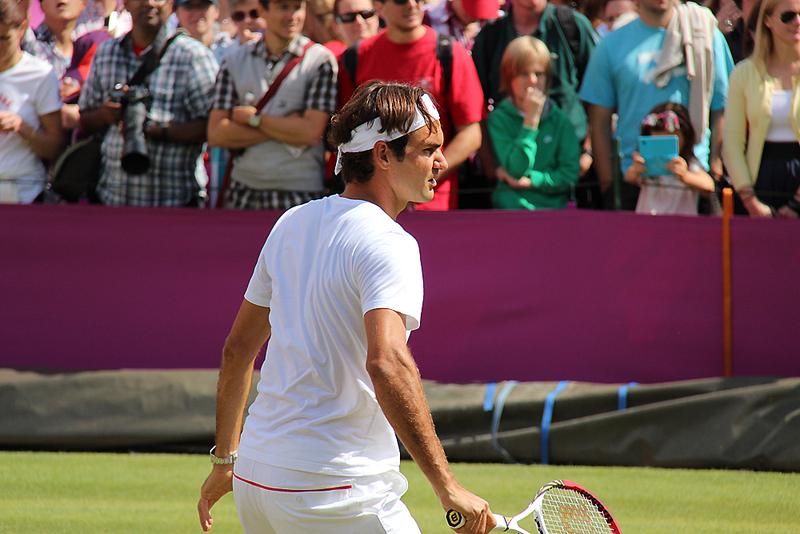 Roger Federer: No. We don’t have that many. They’re for my friends. I don’t know you. But good try. Q: You’re still No. 1. That’s good. 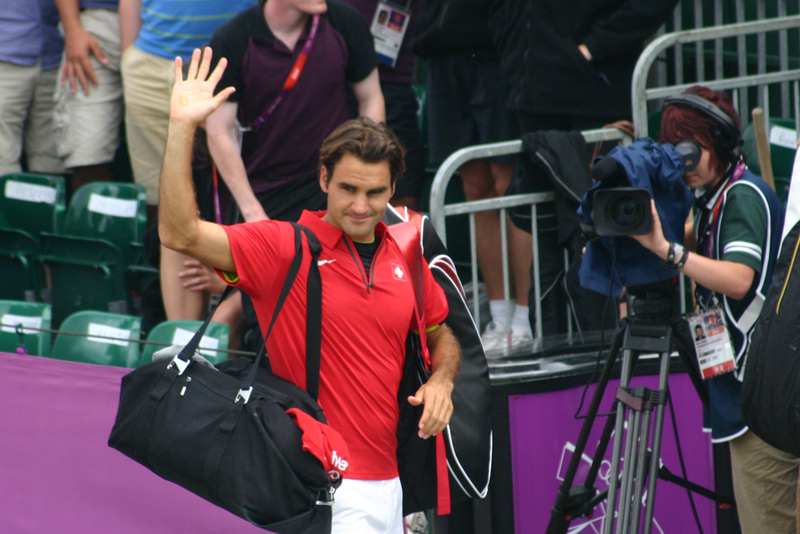 Roger Federer: Thank you. I’m happy you say so. 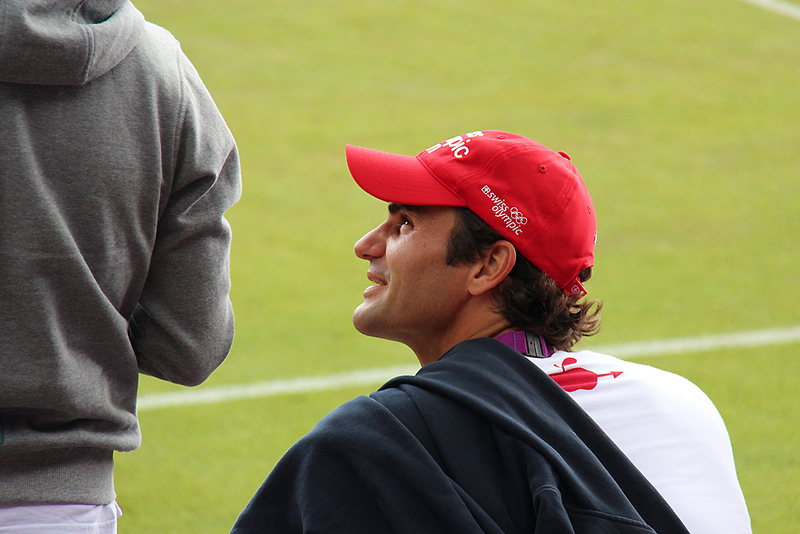 Q: Do you still think you can win Roland Garros? 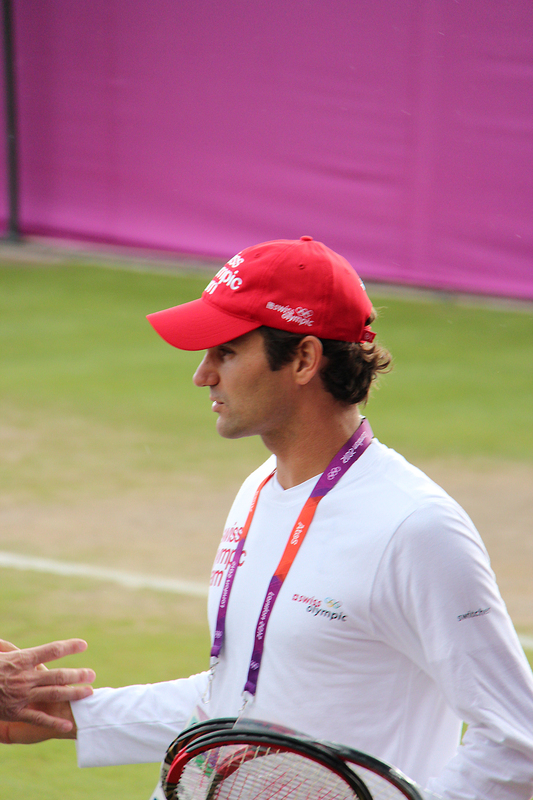 Roger Federer: Well, if you want me to answer no if that makes you happy, then no. Choose the answer. I said yes. 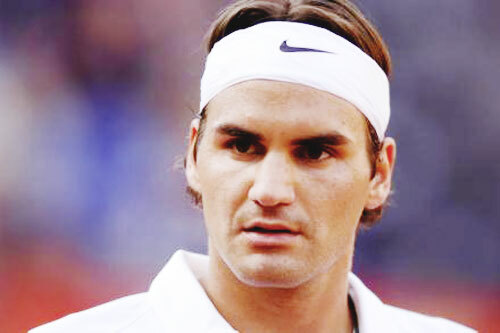 Q: Imagine it’s 2009 and this little fairy comes to you and says, You’re going to win one tournament, but you have to choose – Wimbledon or Roland Garros. Which one? 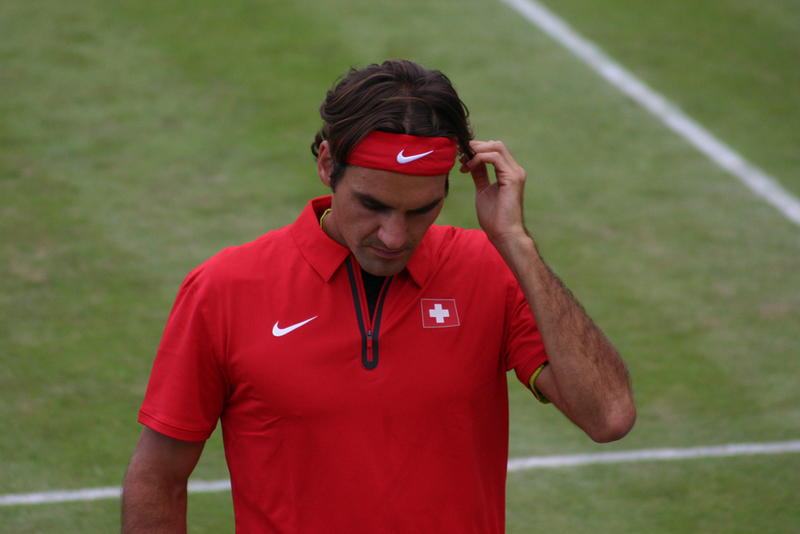 Roger Federer: I don’t want to answer these stupid questions any more. They’re too stupid. 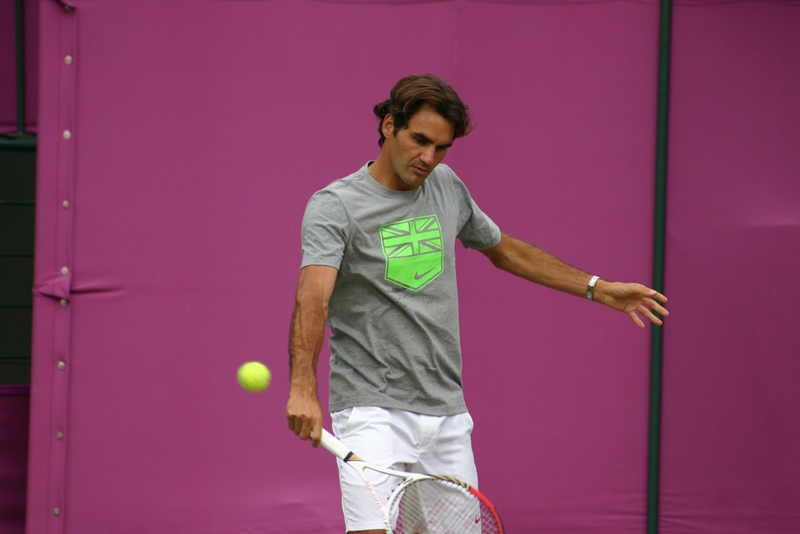 Roger Federer: Because I want to win at everything. I have no preference. Q: So you waited 27 years to win in Paris. 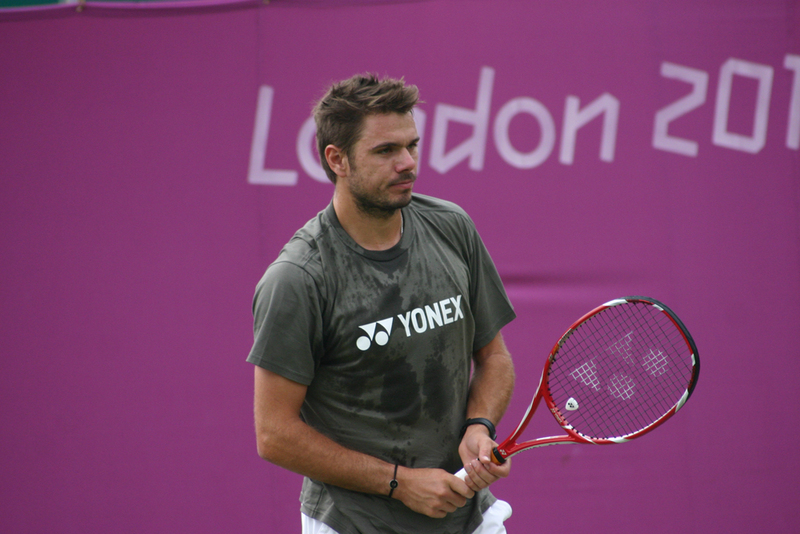 You won the US Open, Wimbledon and the Australian Open much earlier. Does it give a special flavor to this trophy? 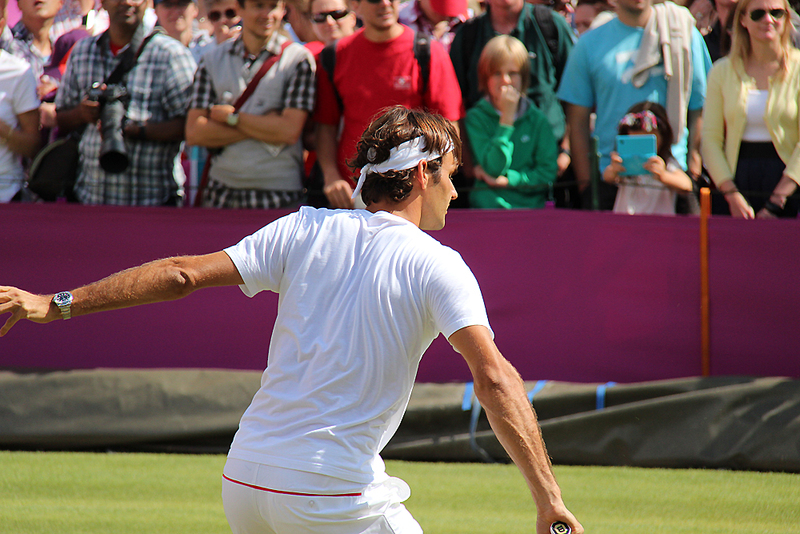 Roger Federer: First, I never waited 27 years, because 27 years ago I was just born. 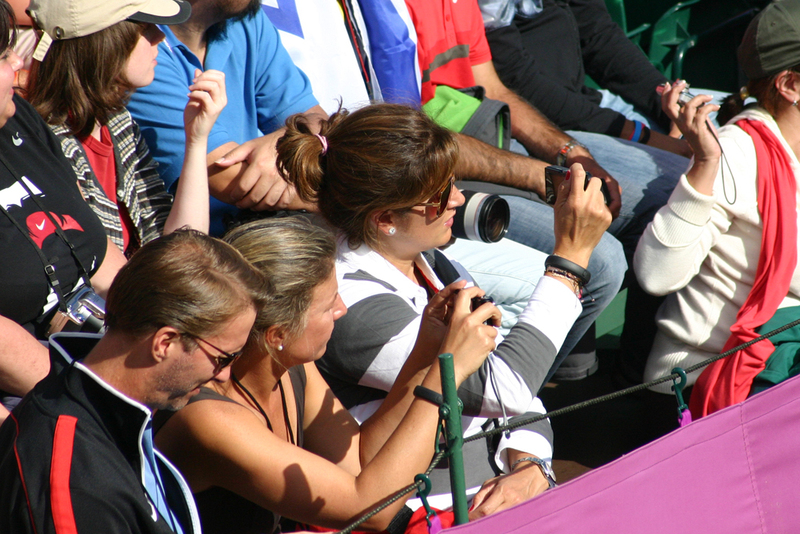 My parents never told me, If you don’t win Roland Garros we take you to the orphanage. I promise you that every single one of these quotes is genuine. As you can probably tell, they’re from various different press conferences over the years. 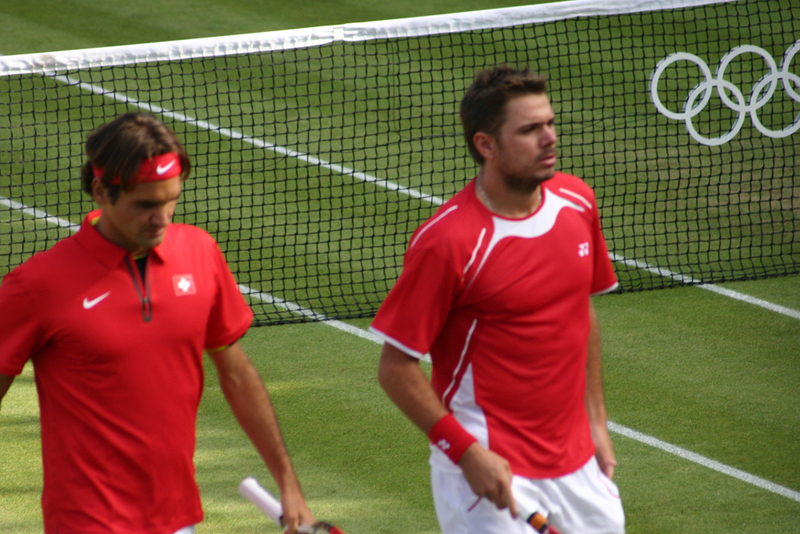 The “dating Nadal” one is from here. The TV picture quality one is from here. This is the one about him being on the car. This is the towel one. 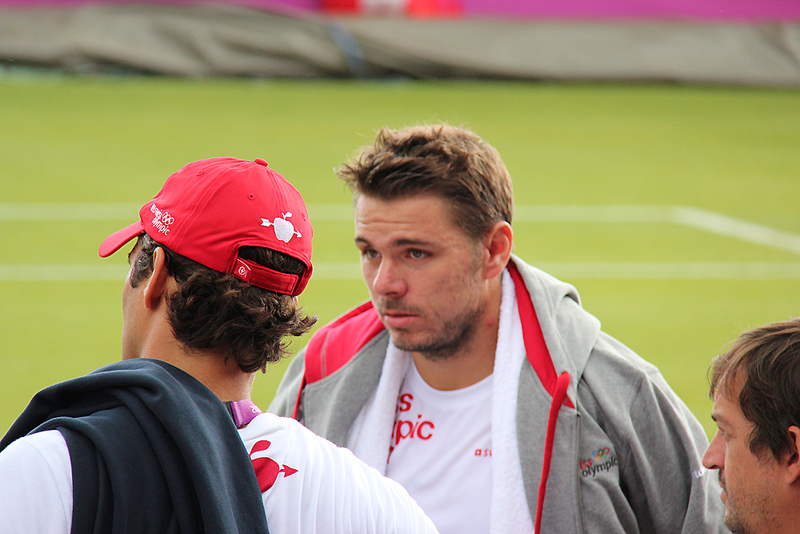 This is the one about him still being #1 and thinking he can win RG again and his ‘stupid questions’ response! The ‘take you to the orphanage’ one is from here. This is the ‘last question you didn’t expect’ one. 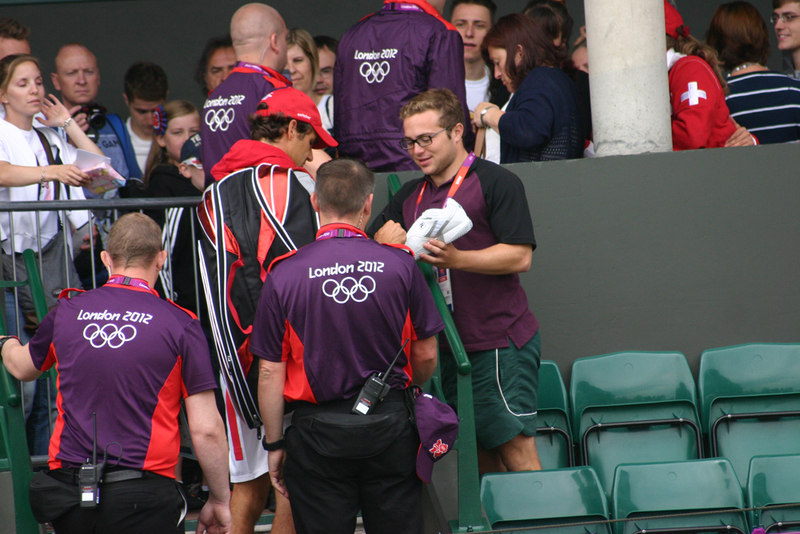 The naked one is only available here but occurred at Indian Wells 2004. The Sampras one I can’t find online but it was posted on a forum at the time. I never knew much about tennis till my 10th grade.. after my secondary school I had this one friend called nikitha.. she is the one who used to tell about tennis n how much she liked federer.. when I came to know about him I really started liking him ..n when I saw his match.. wow that was the time I became his fan… n when I heard about his charity.. 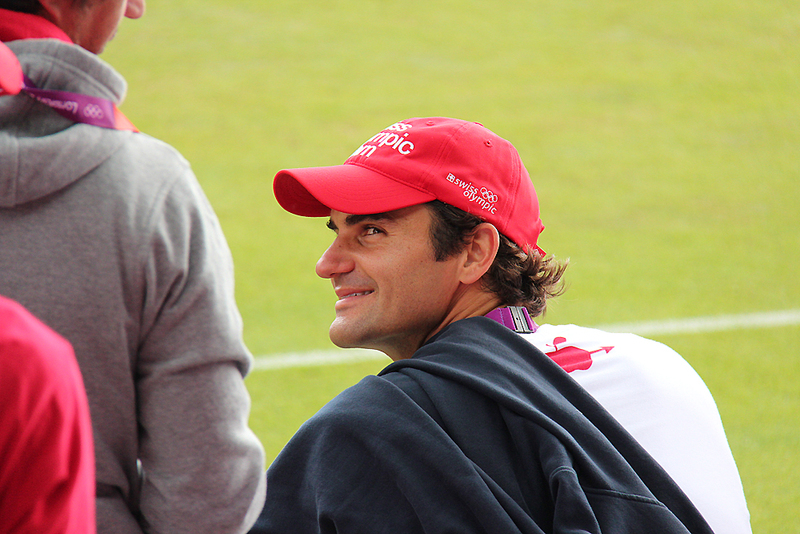 I felt really happy n proud to be a federer fan…!! Follow @deeps_4ever on Twitter HERE!